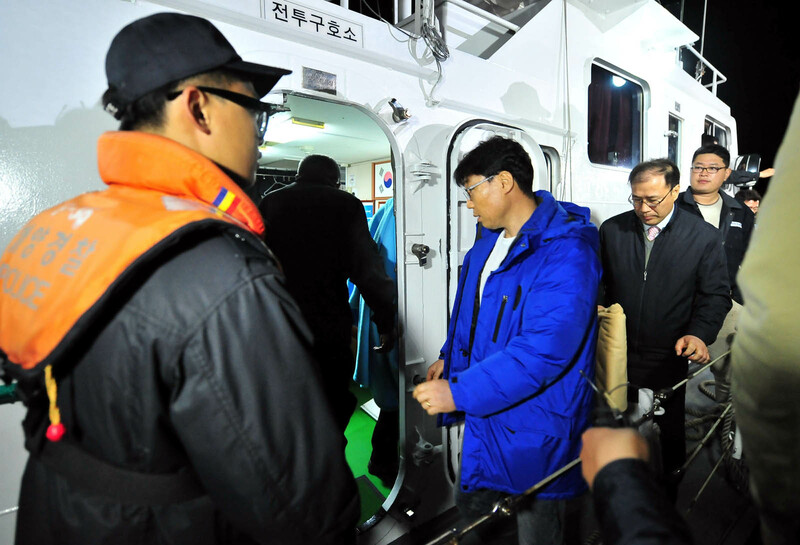 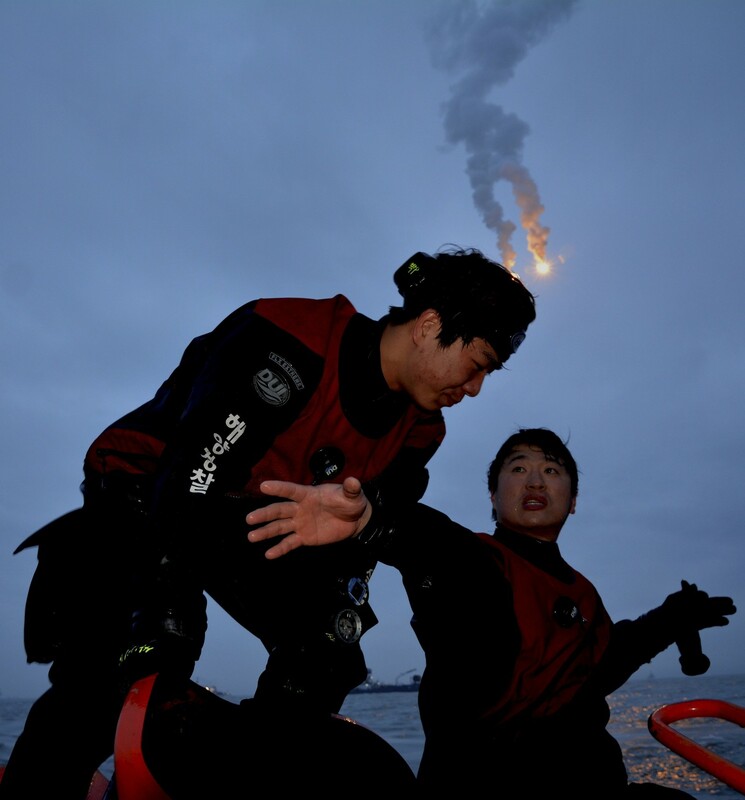 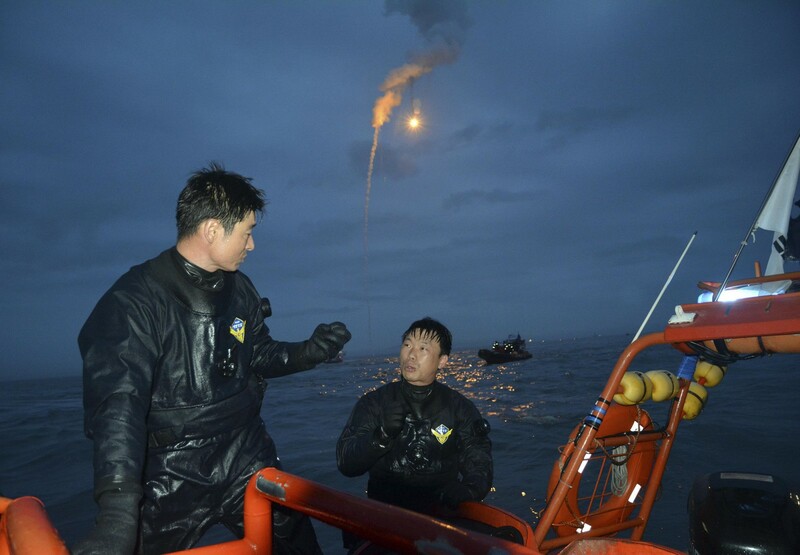 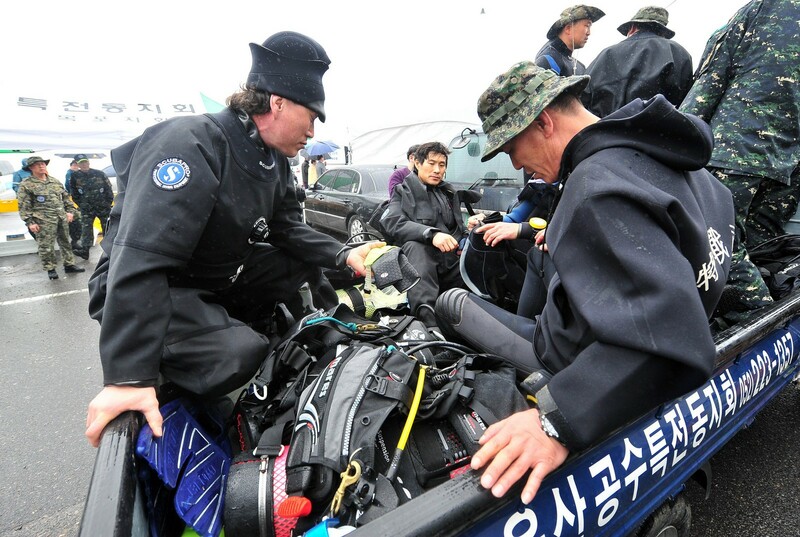 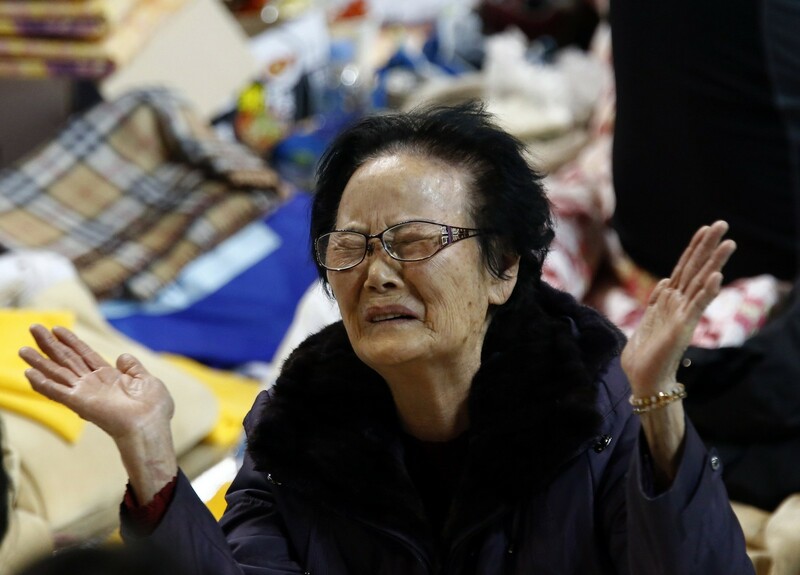 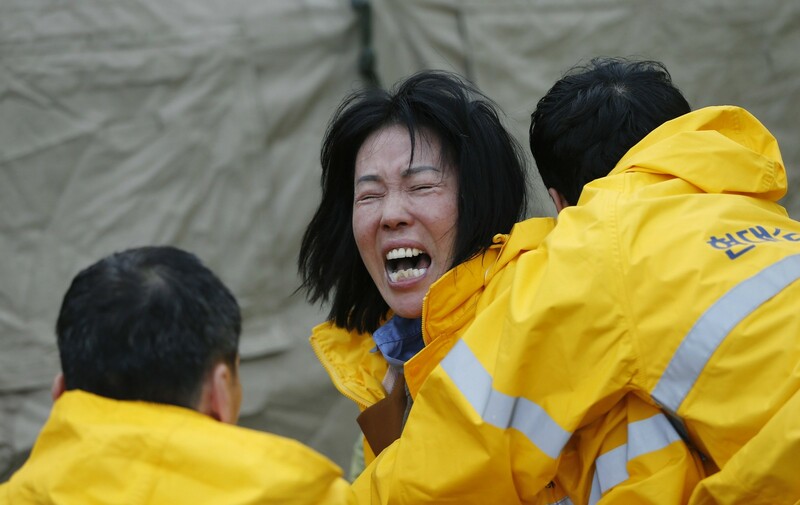 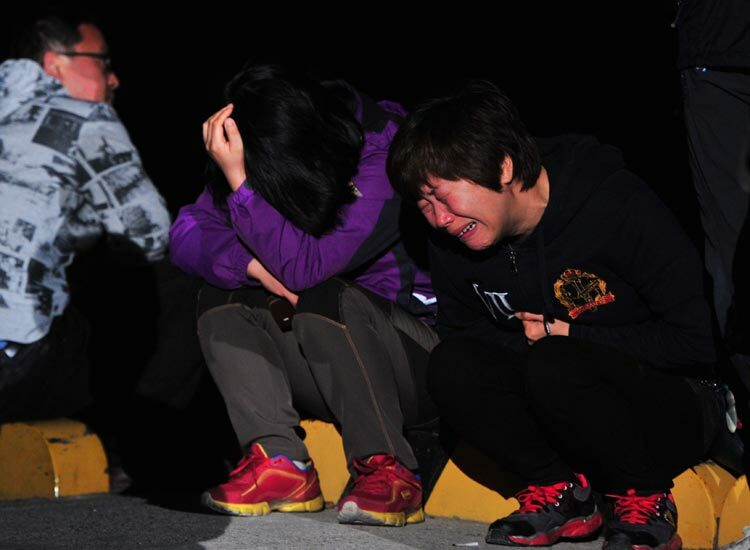 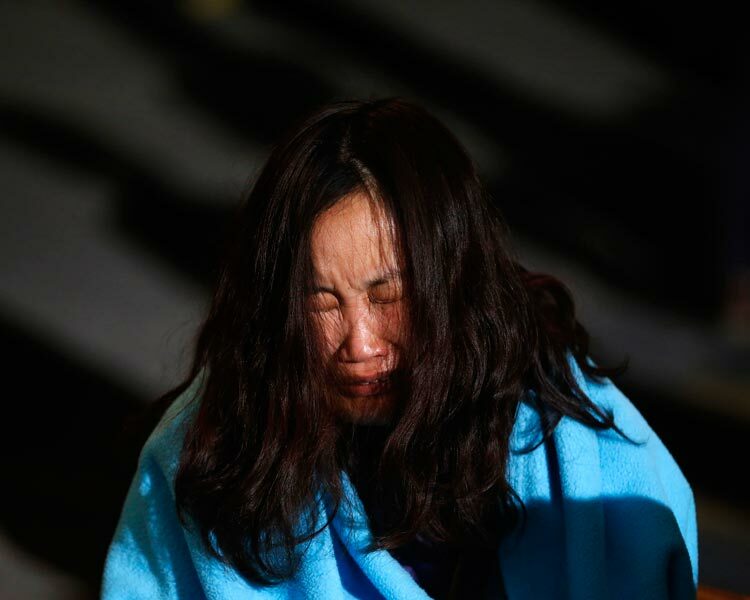 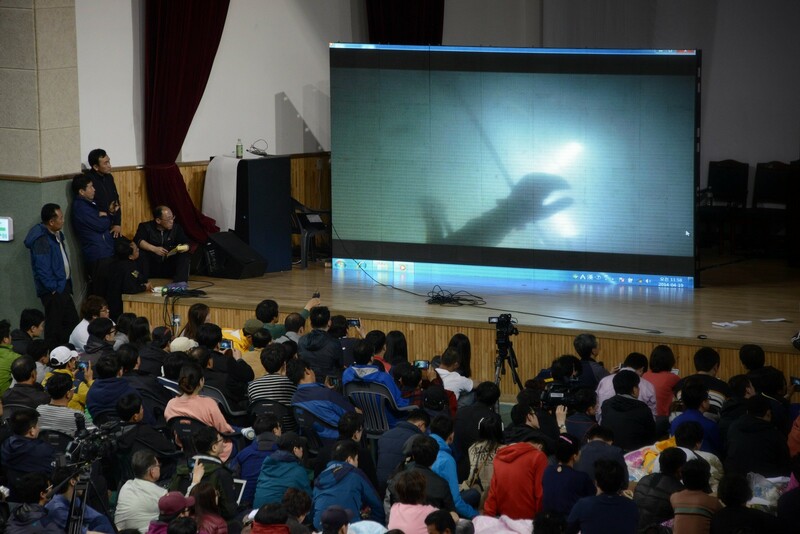 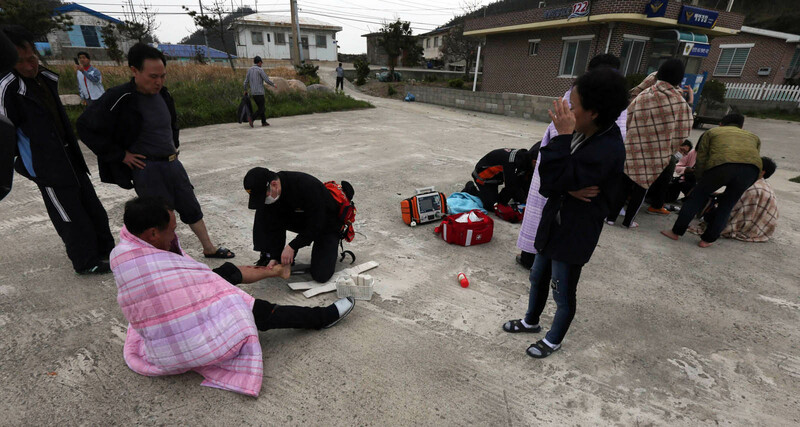 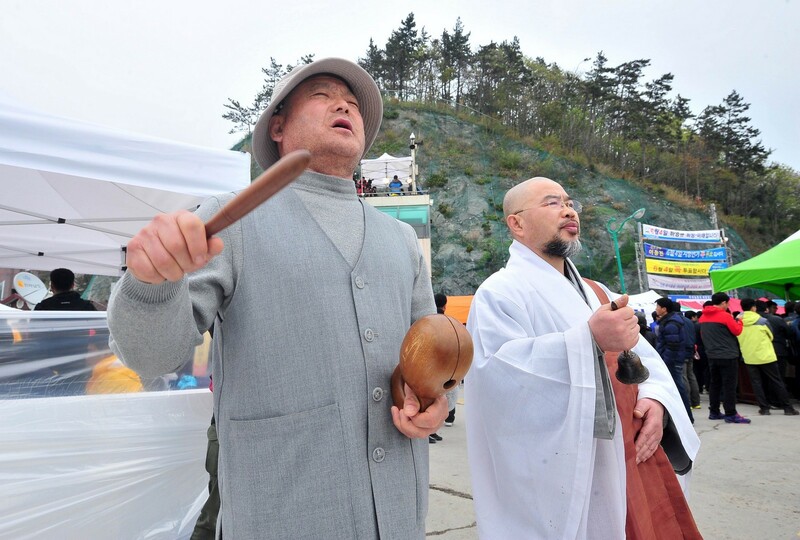 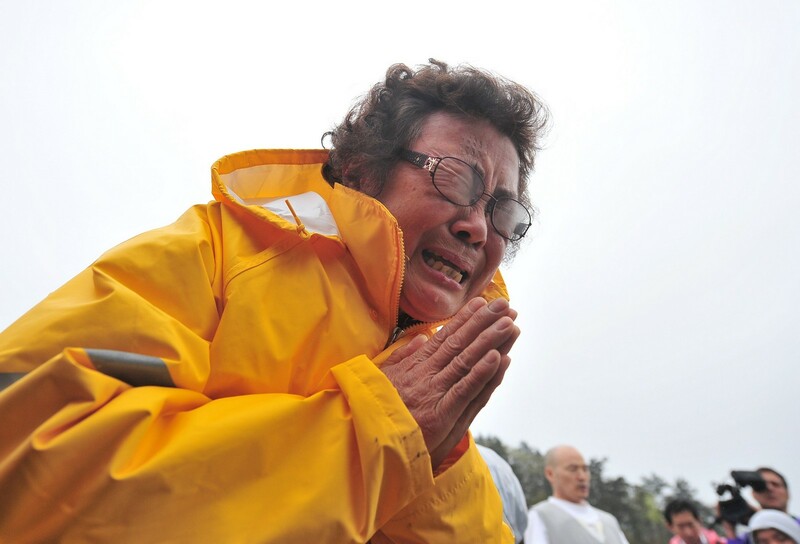 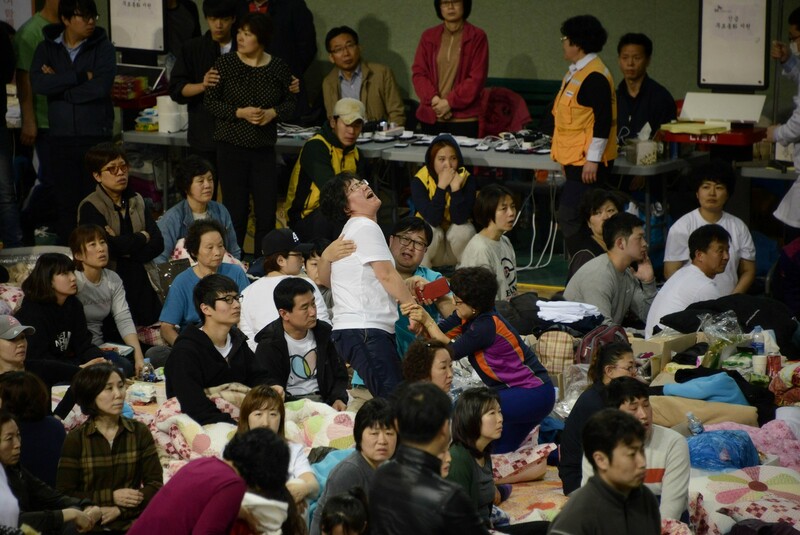 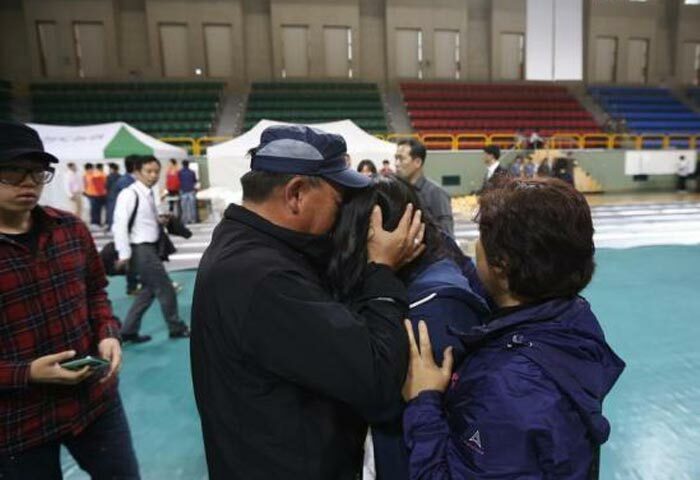 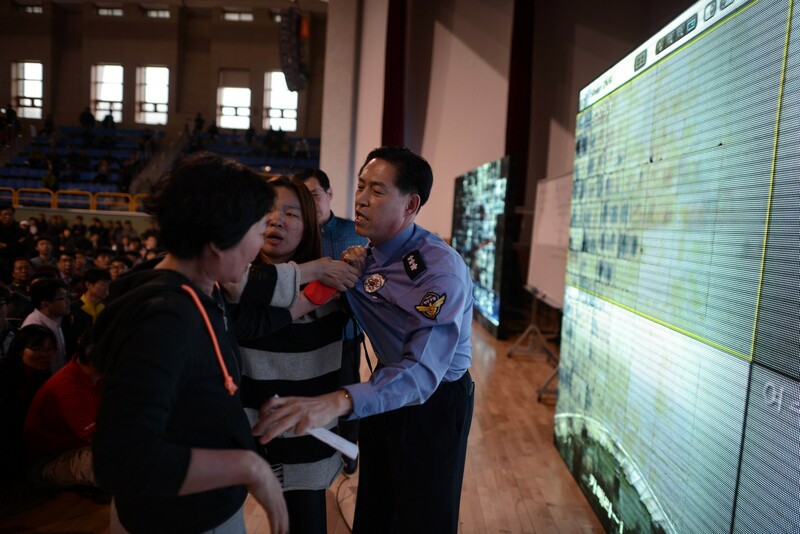 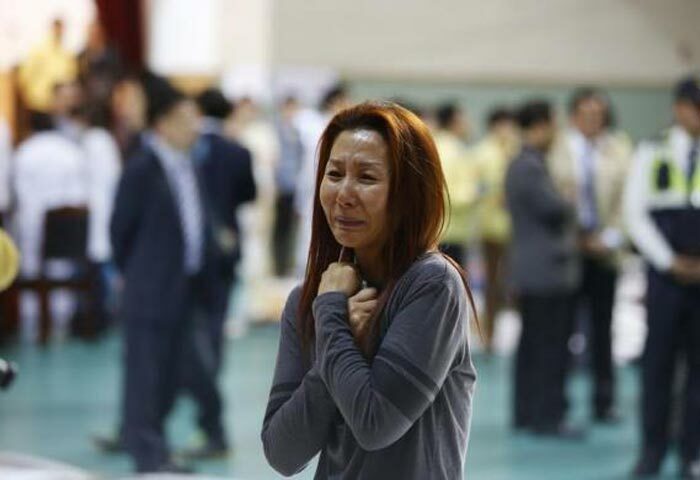 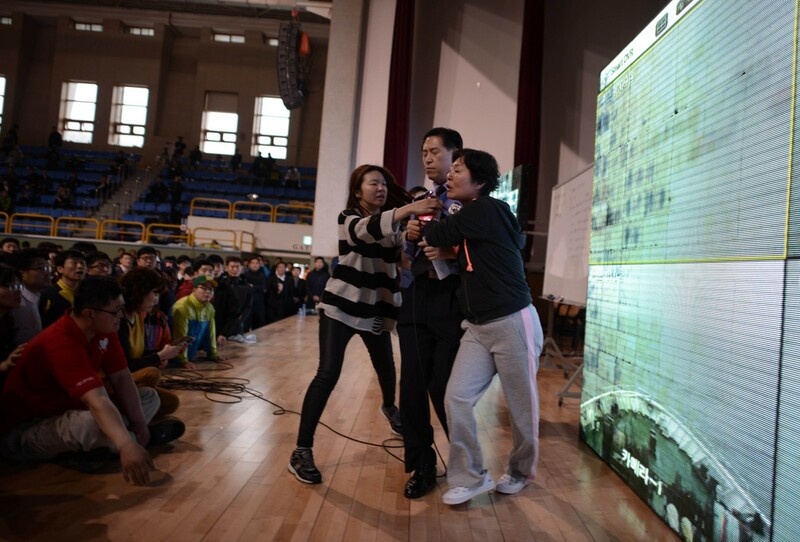 The family member of a missing passenger from South Korean ferry "Sewol", which sank in the sea off Jindo, shouts as he complains to officials from the South Korean Coast Guard. 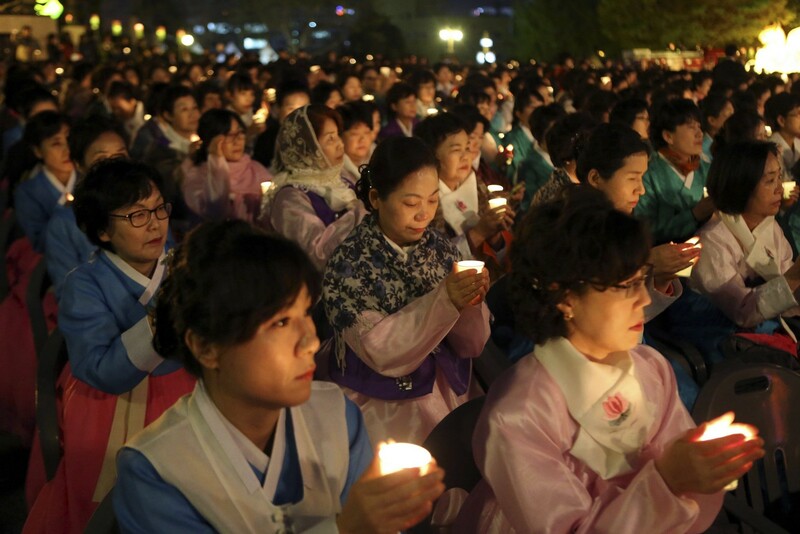 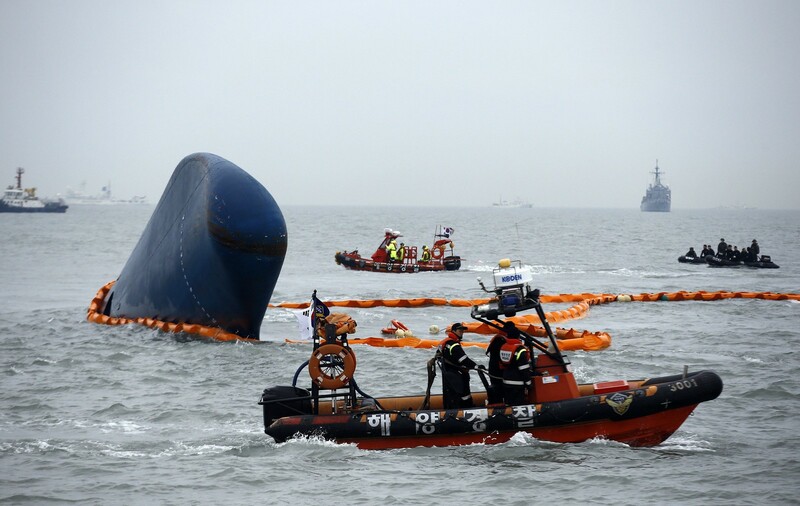 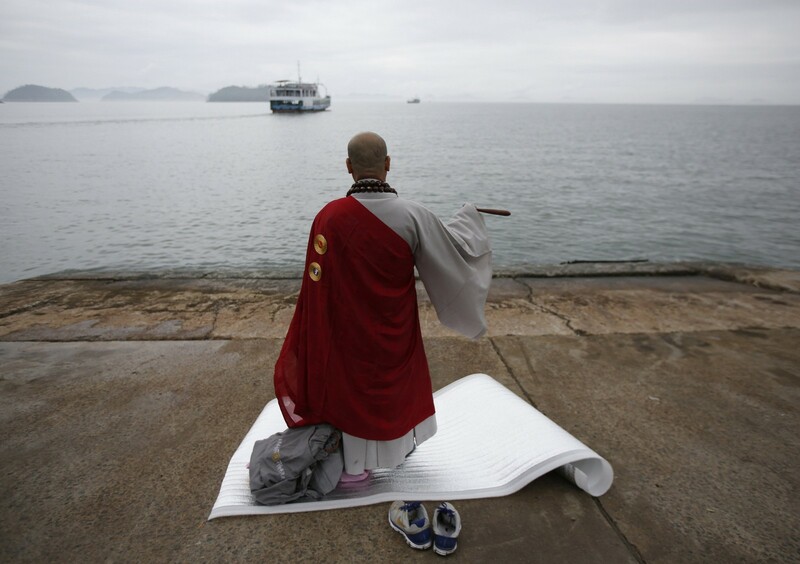 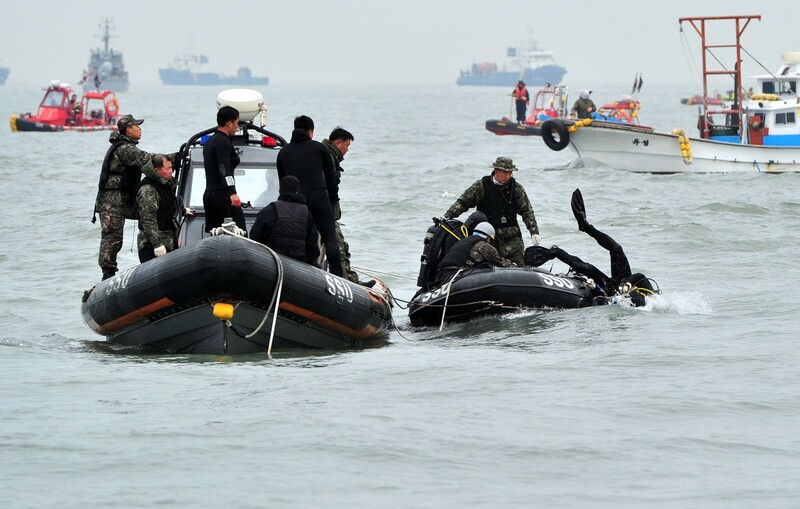 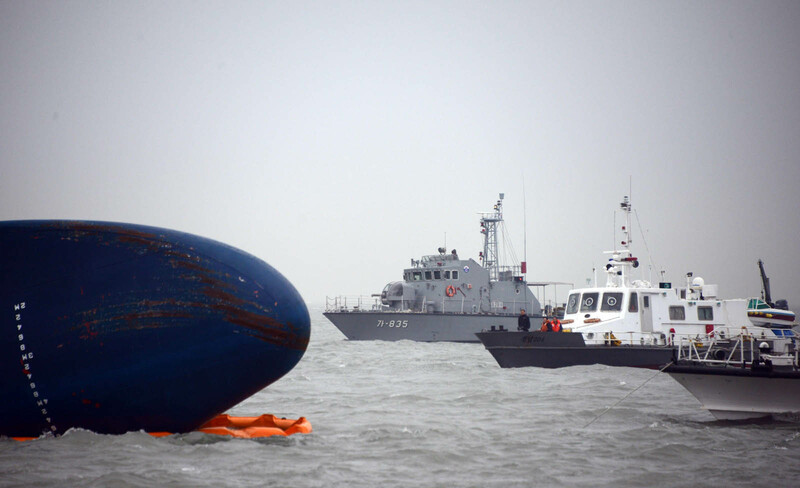 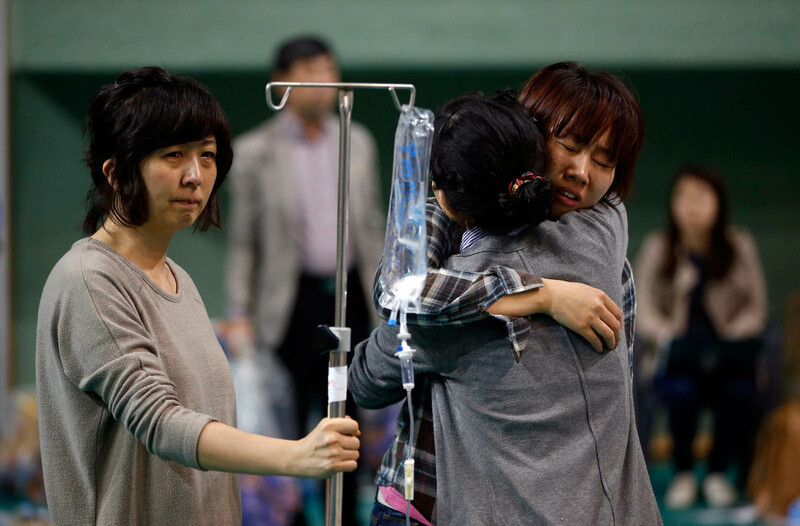 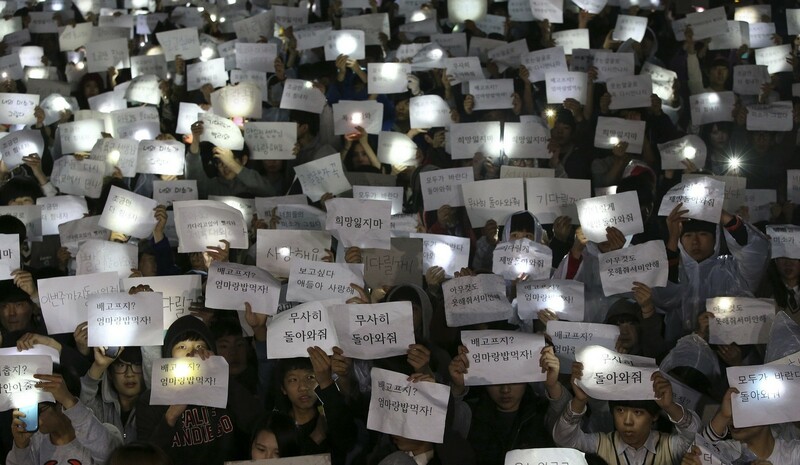 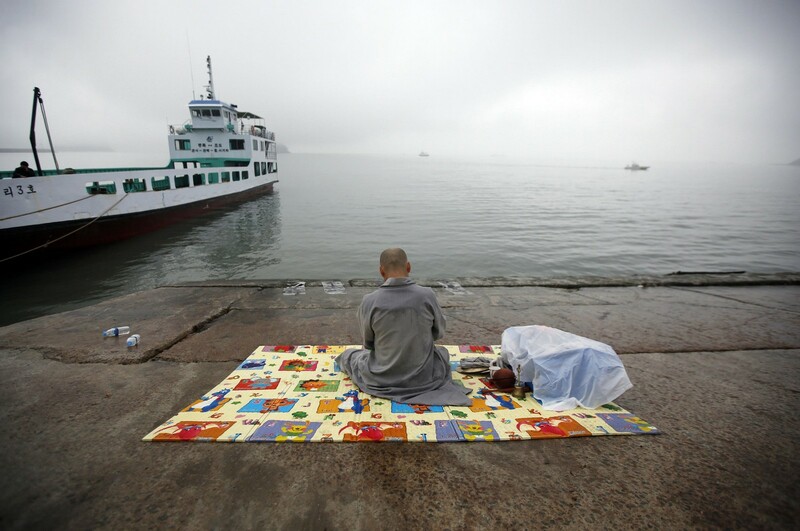 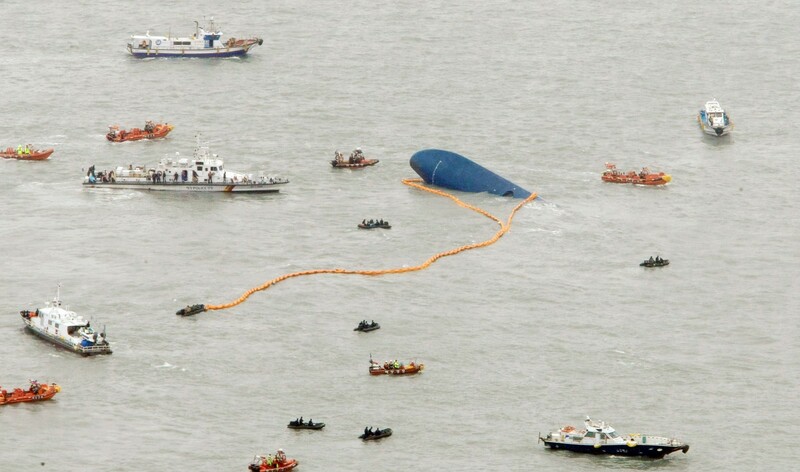 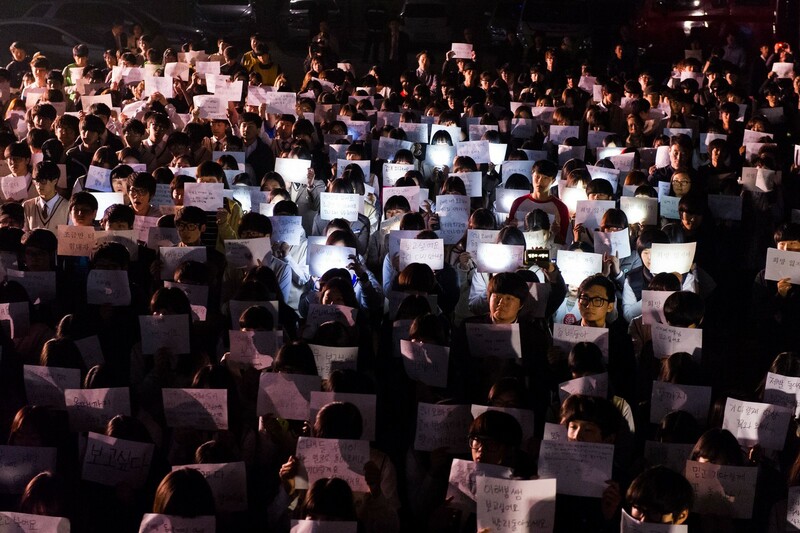 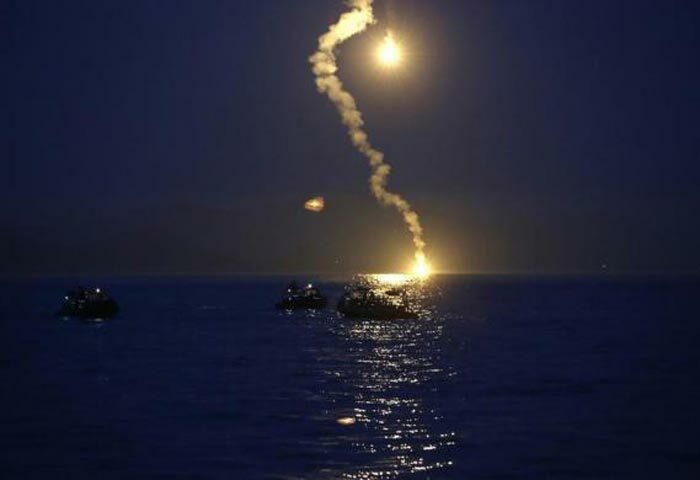 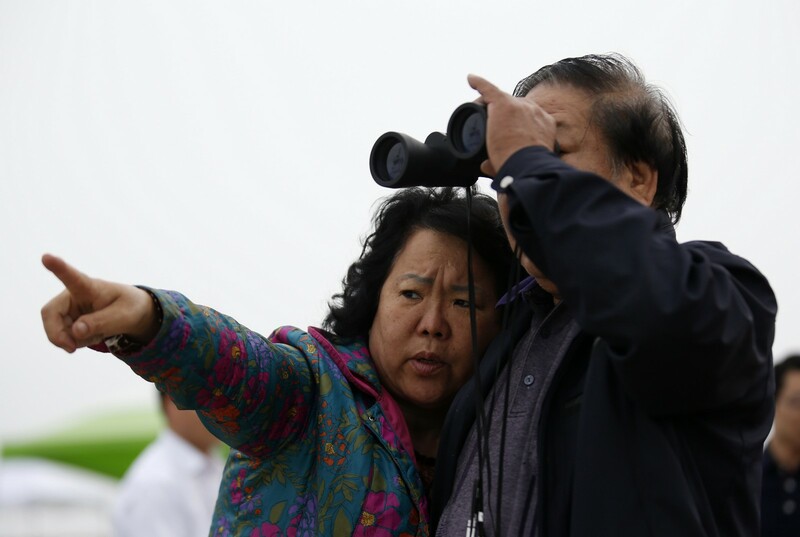 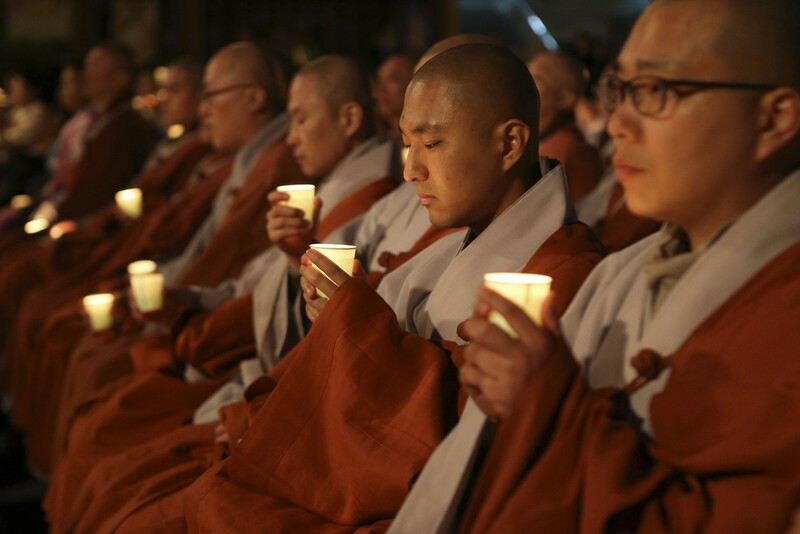 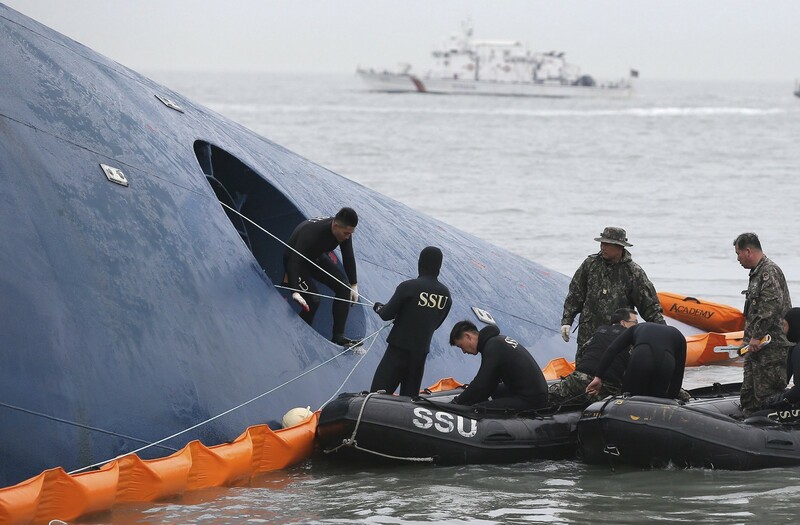 SEOUL - In the hothouse atmosphere of anger and grief triggered by South Korea's ferry tragedy, the slightest misstep or ill-timed remark by any official can carry career-ending consequences. 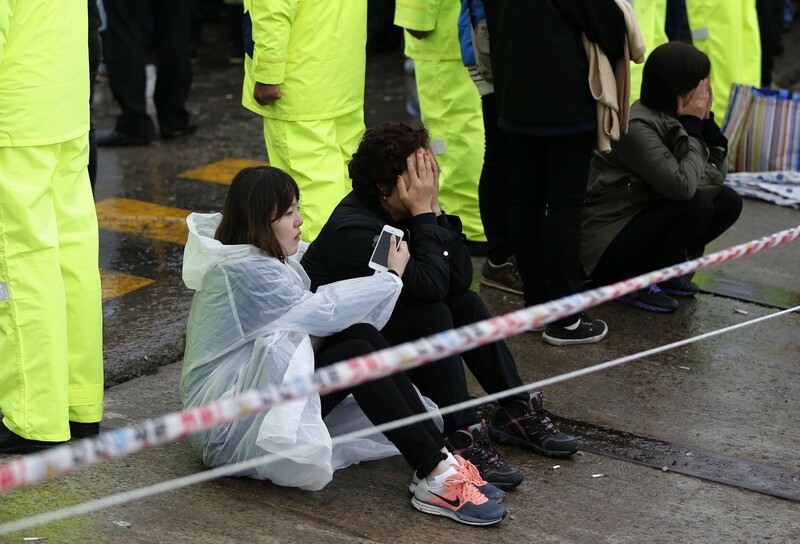 The heavy death toll, and the fact that so many of those who died were children, have fuelled a desire for retribution that has taken on a distinctly anti-establishment flavour. 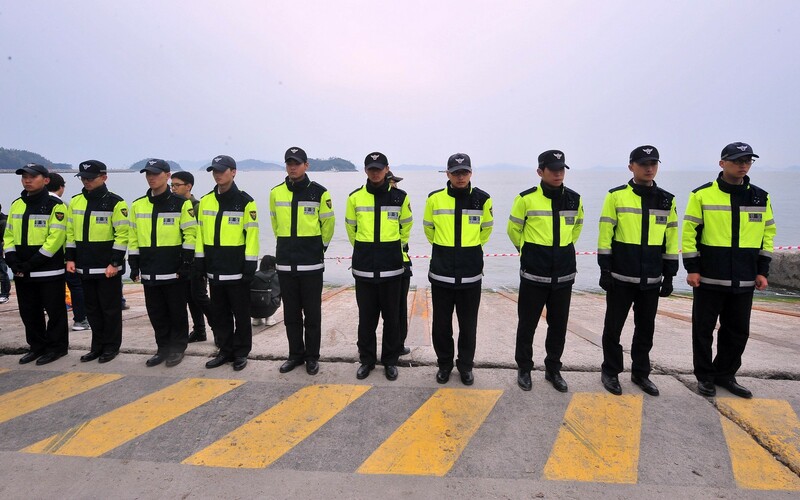 Aside from obvious targets like the captain and crew and the ferry owners, public anger has been directed at pretty much anyone in a position of power or influence. 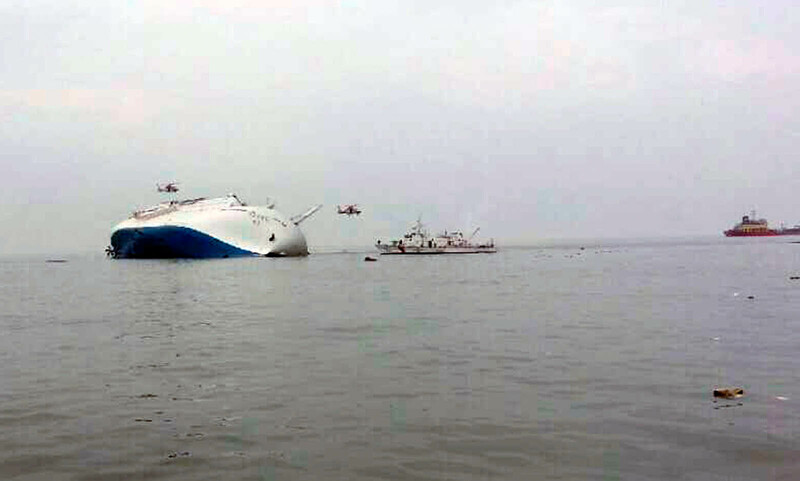 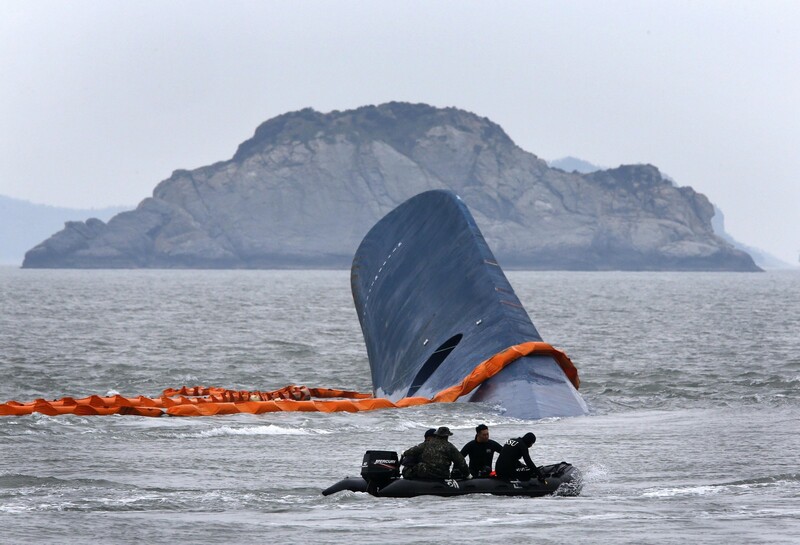 There is a general consensus that the ferry sinking has pulled back the covers of the country's great economic success story and revealed a corrupt, incompetent body politic which allows such disasters to happen. 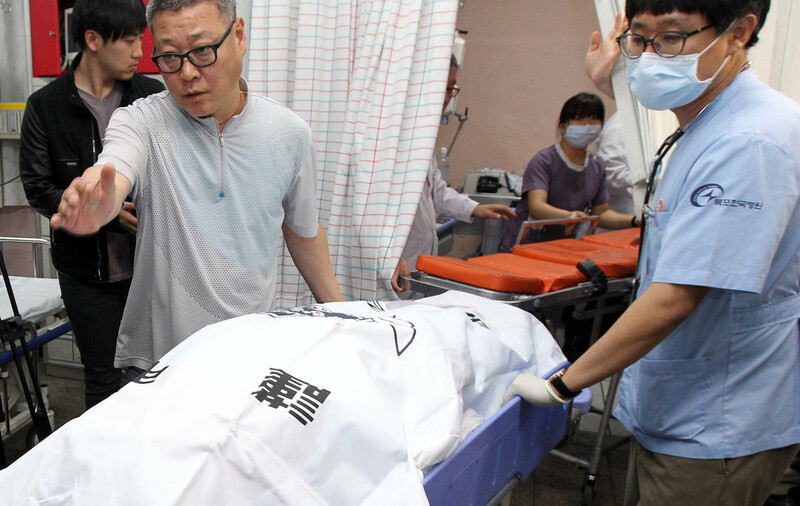 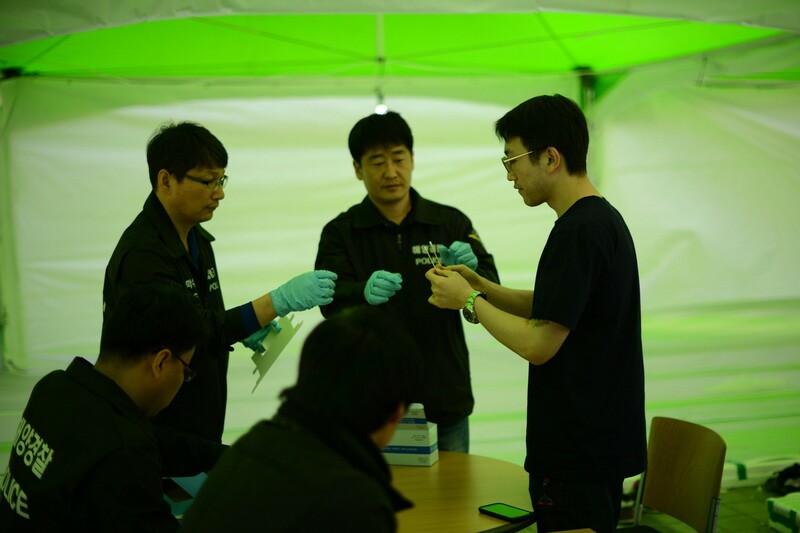 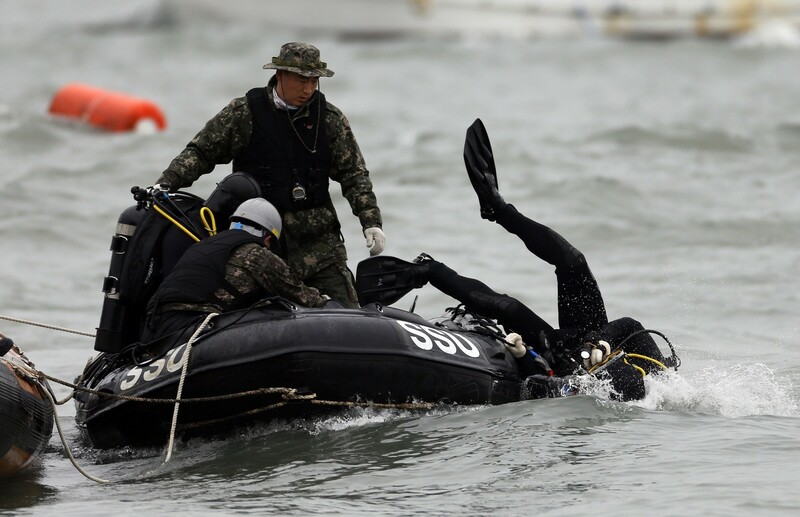 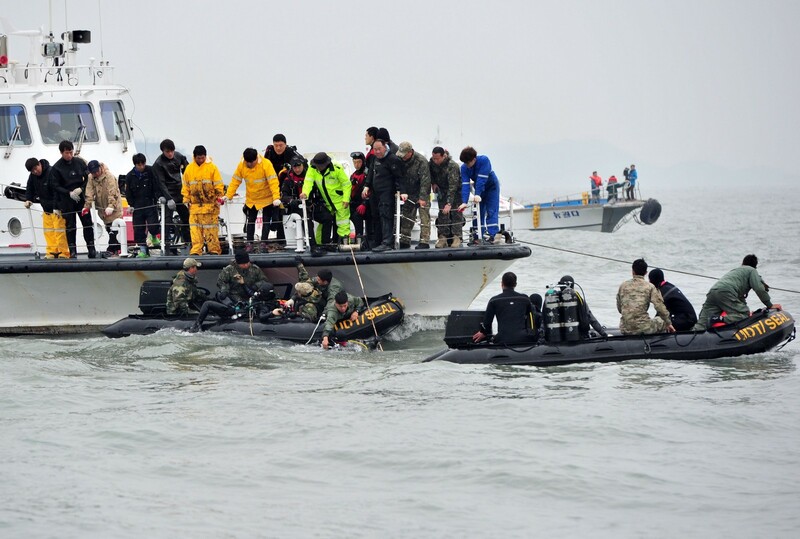 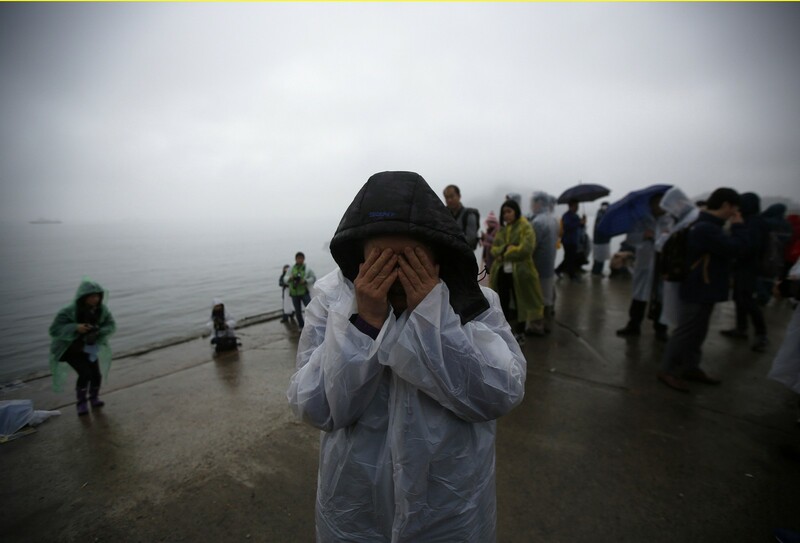 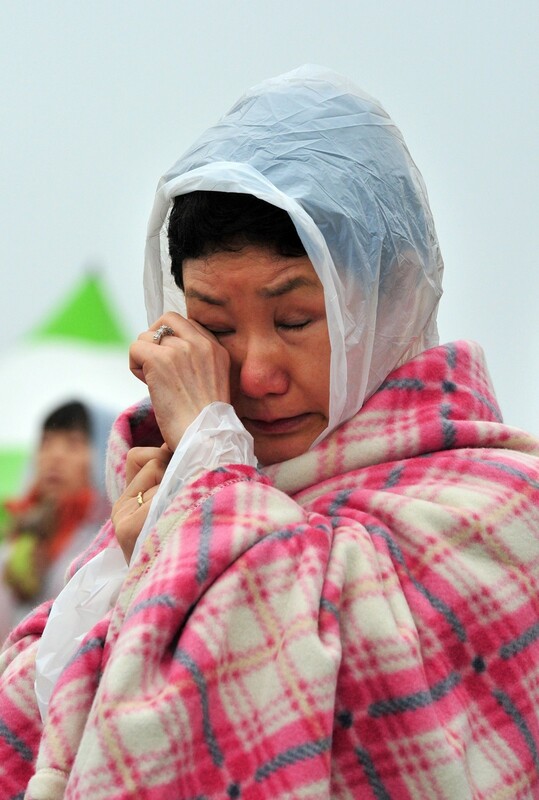 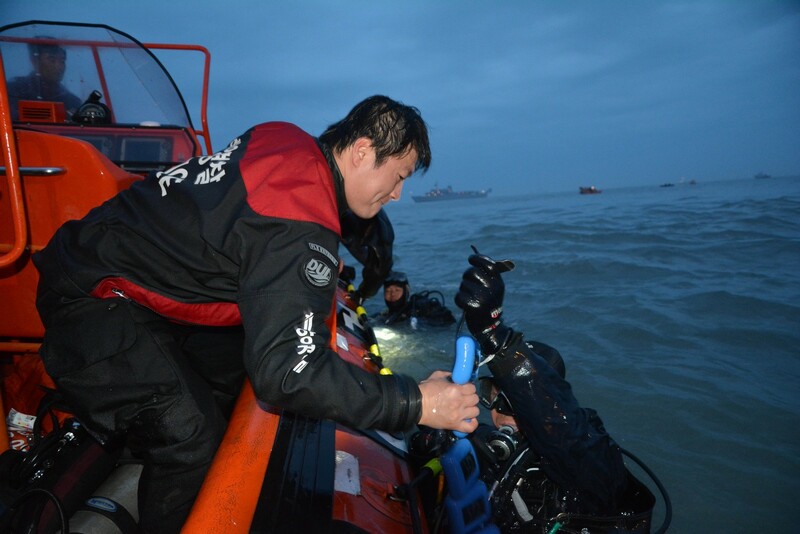 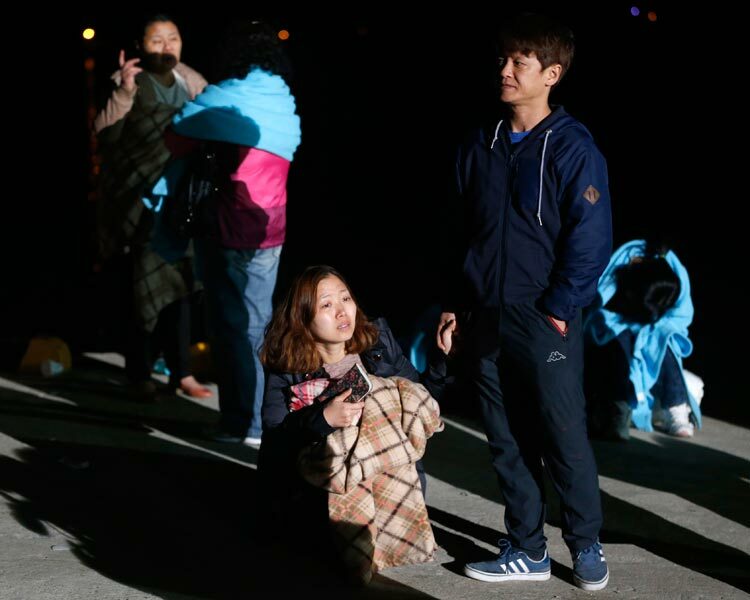 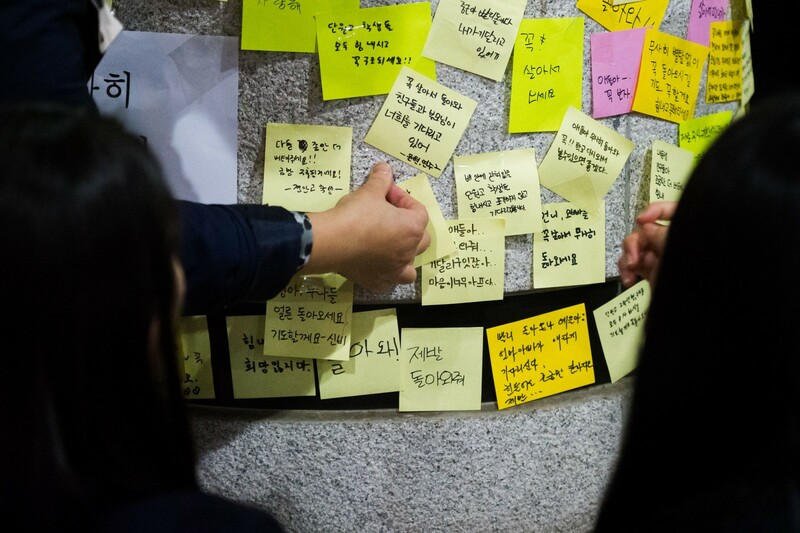 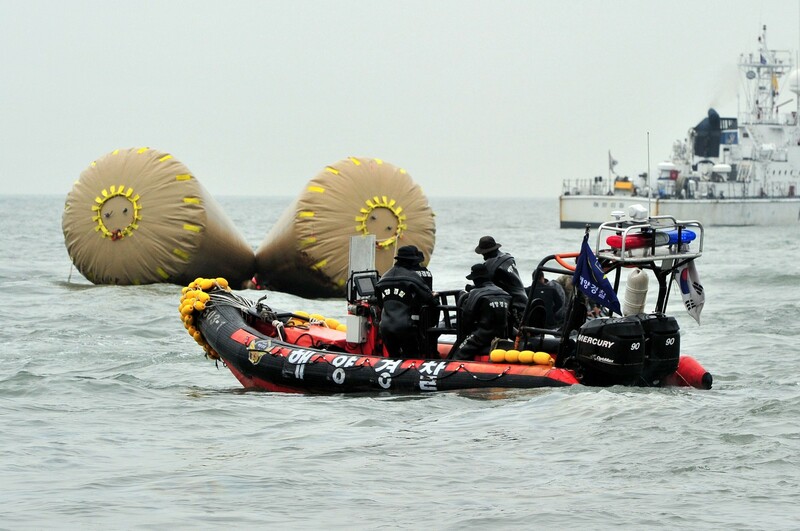 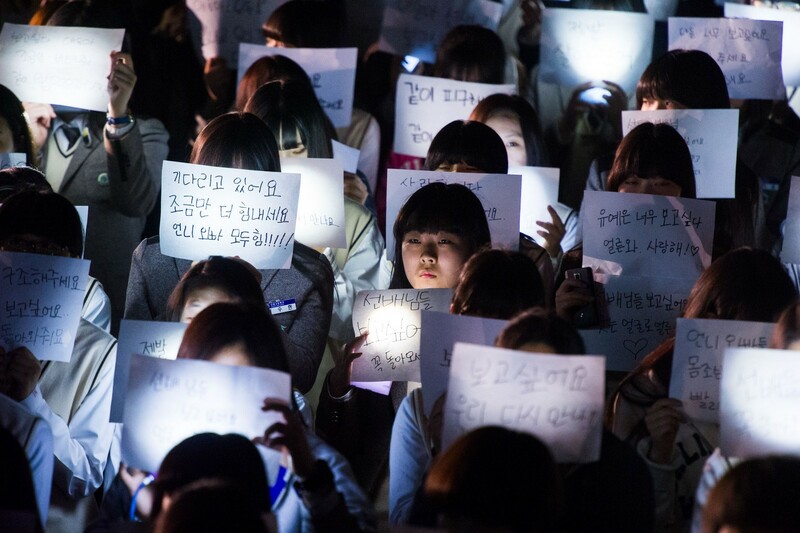 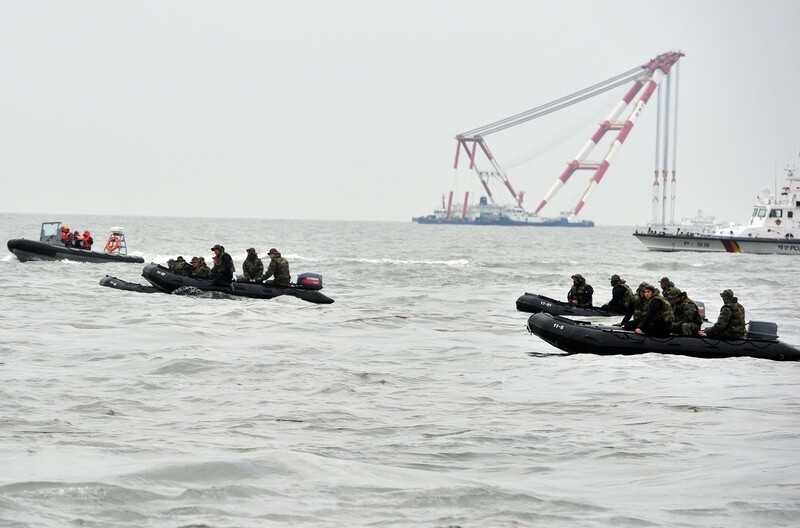 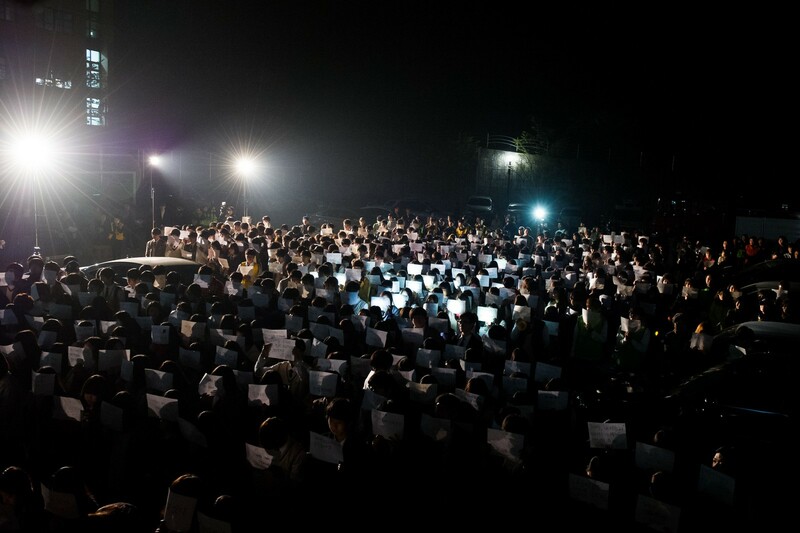 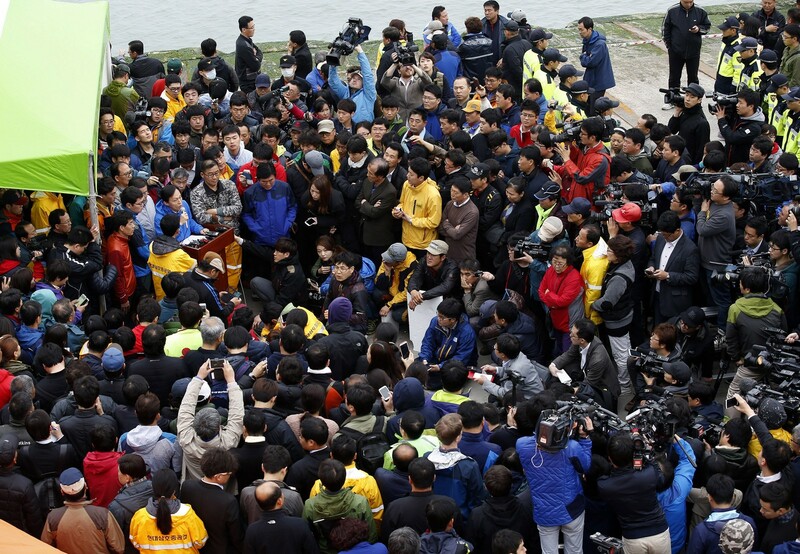 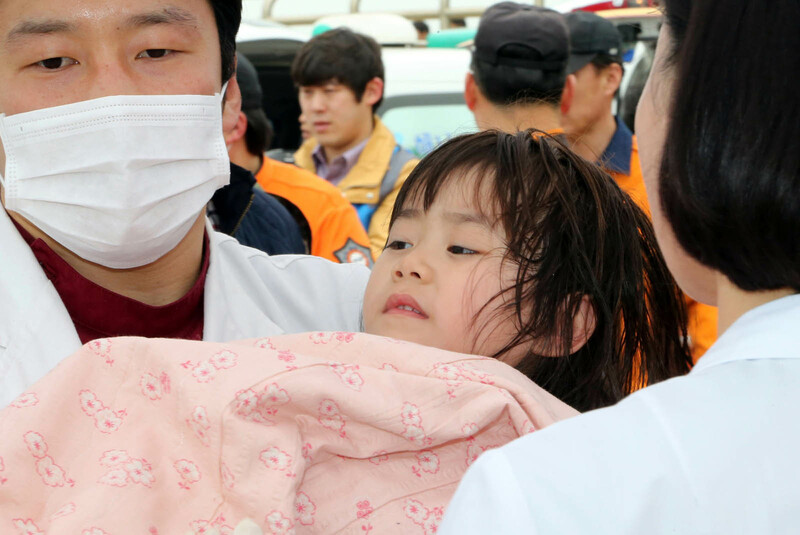 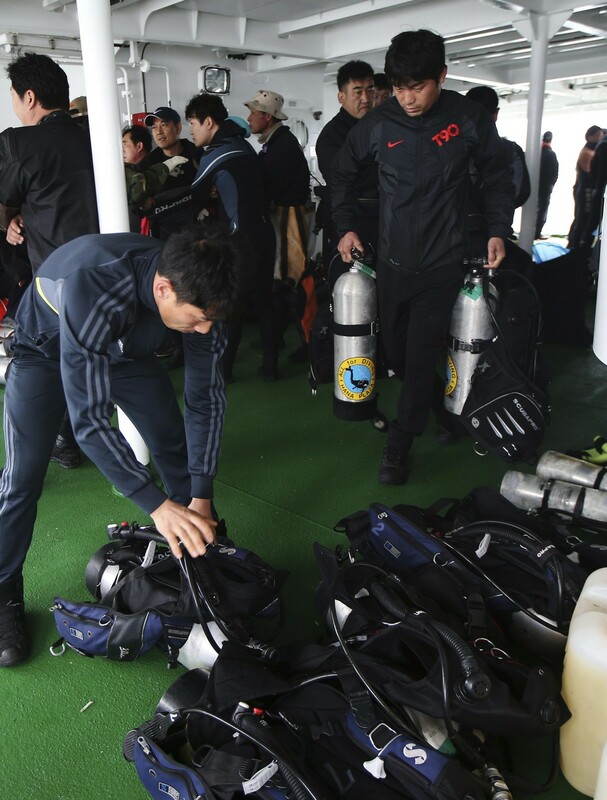 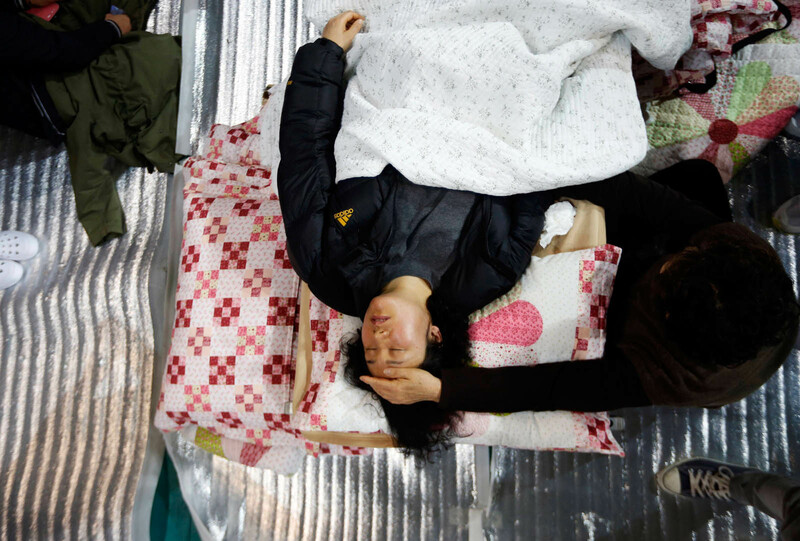 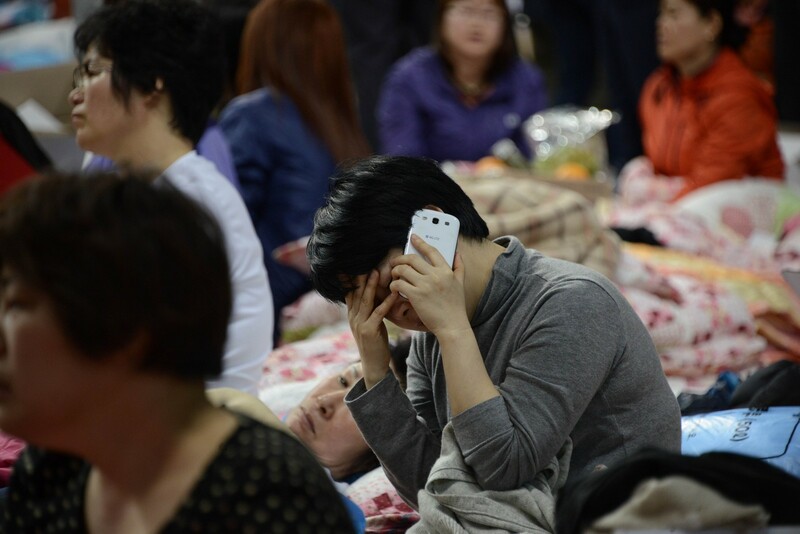 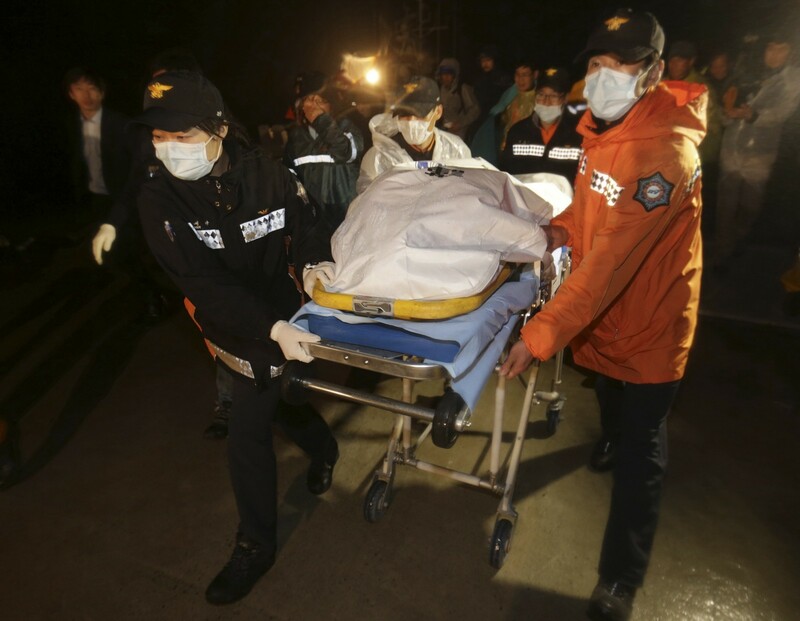 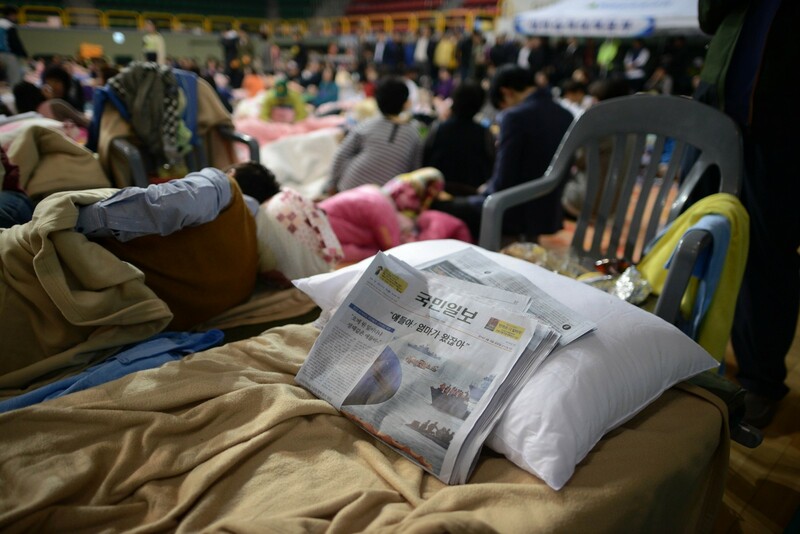 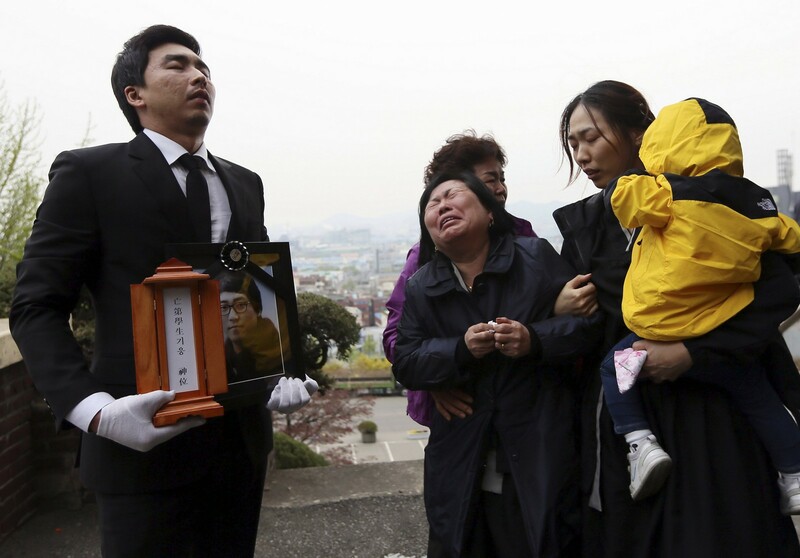 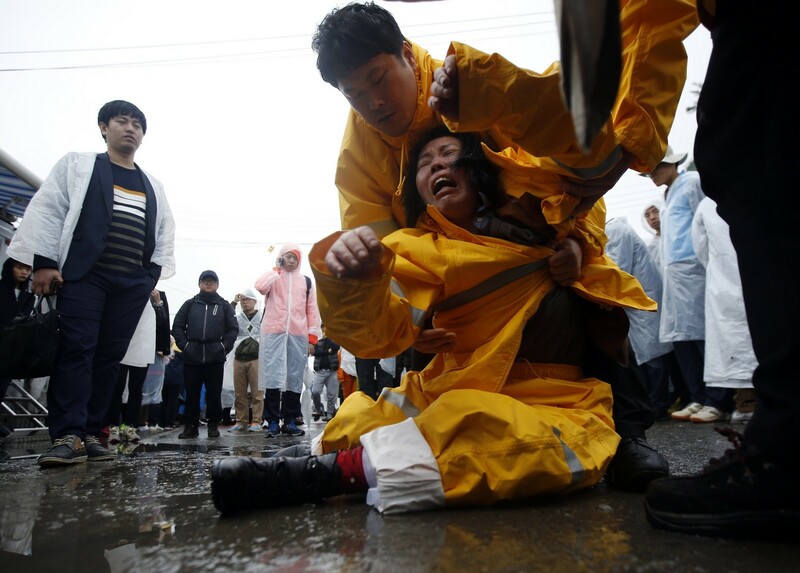 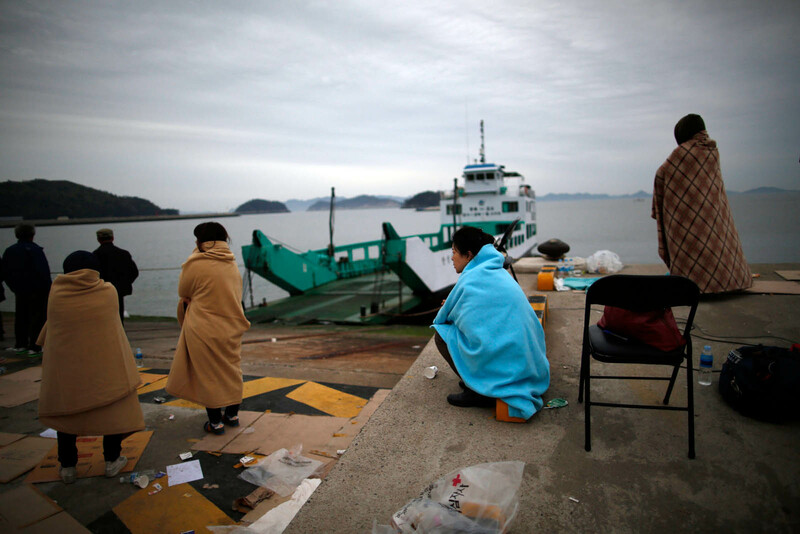 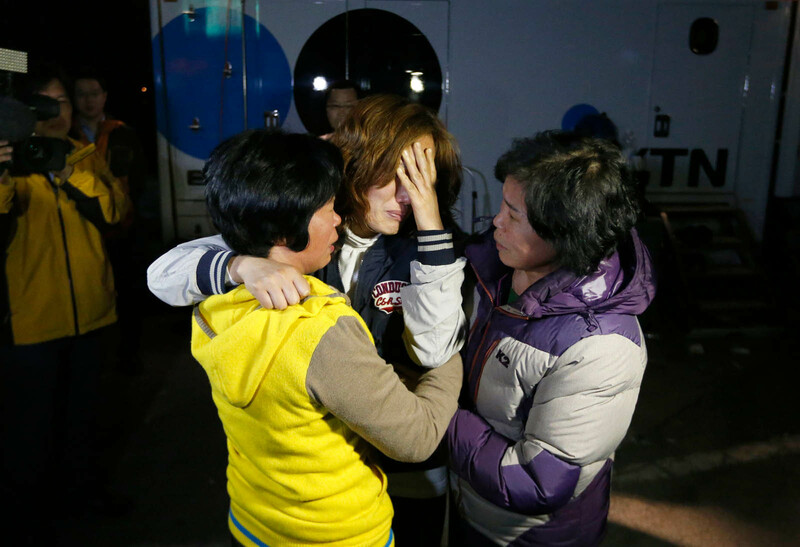 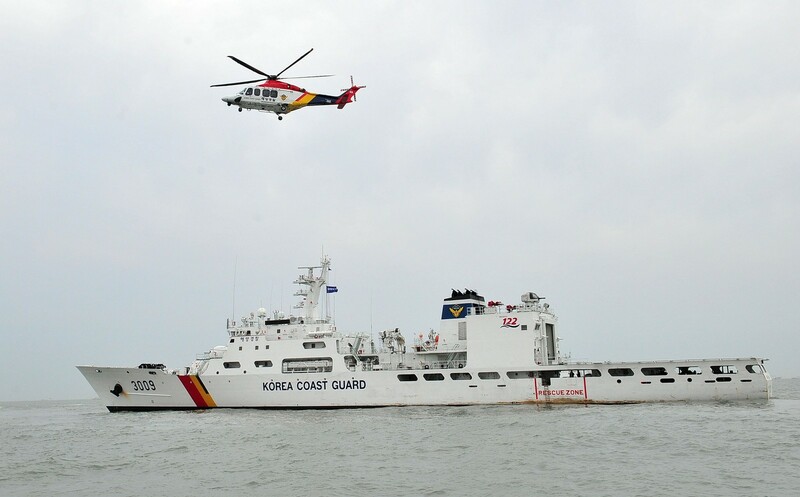 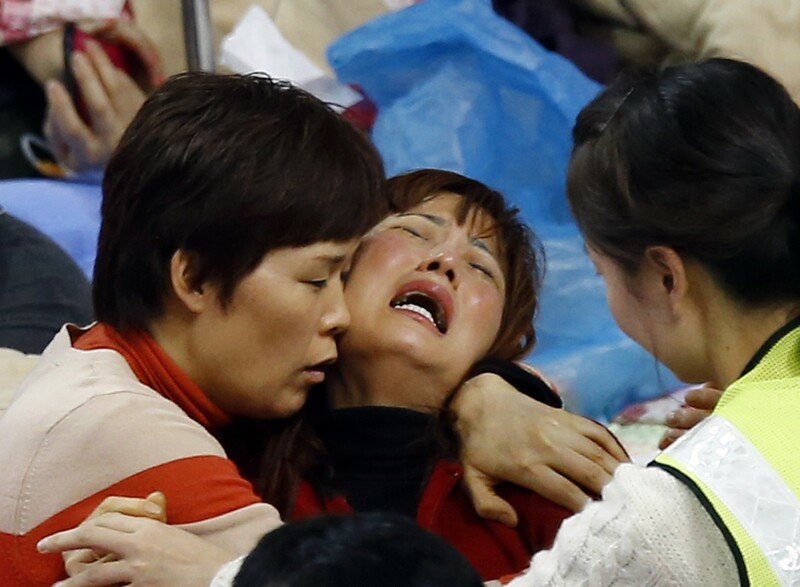 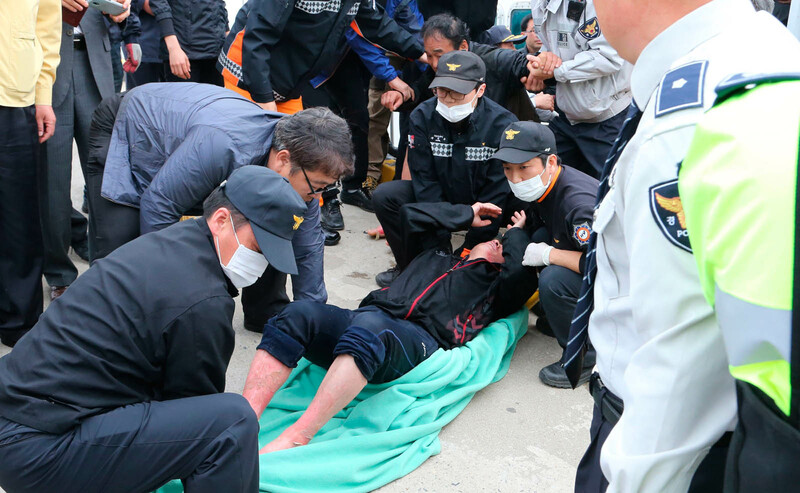 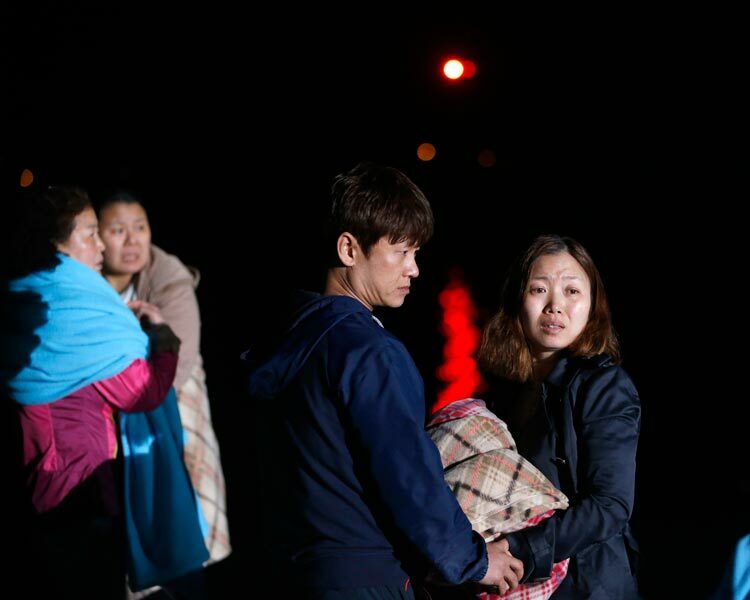 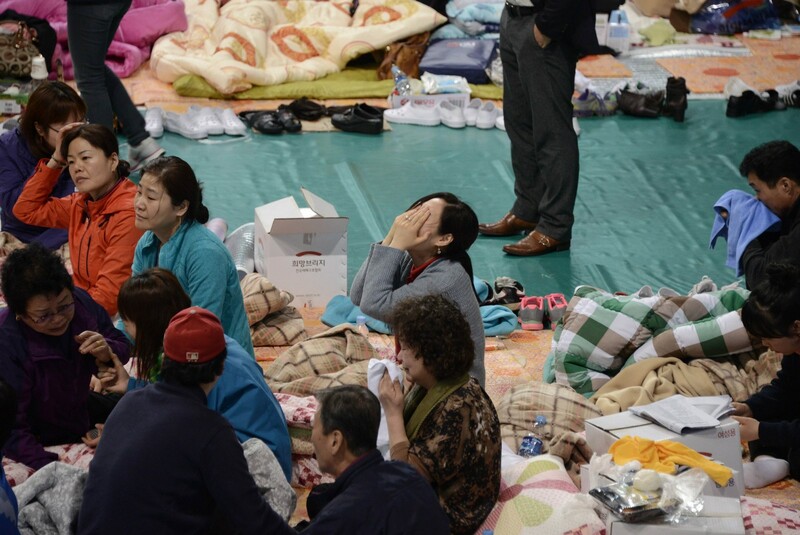 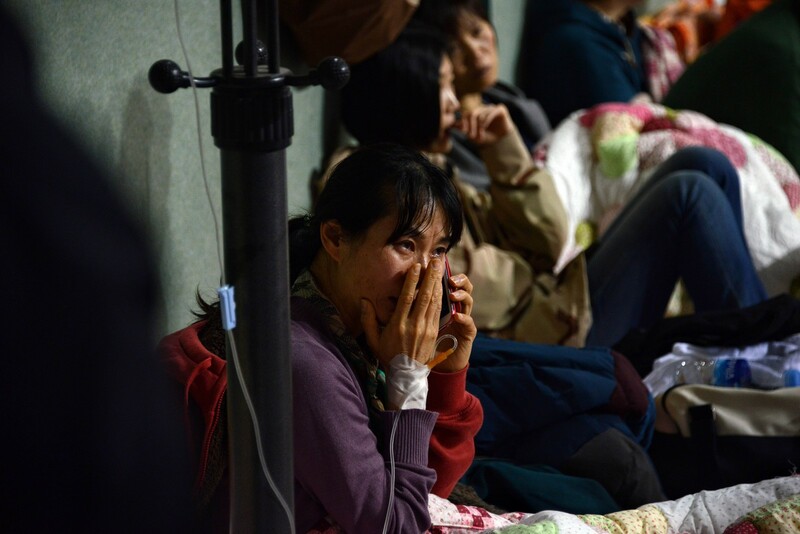 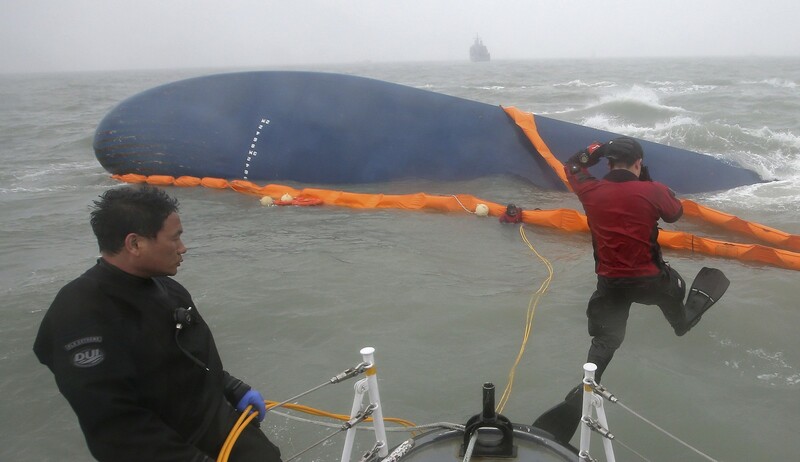 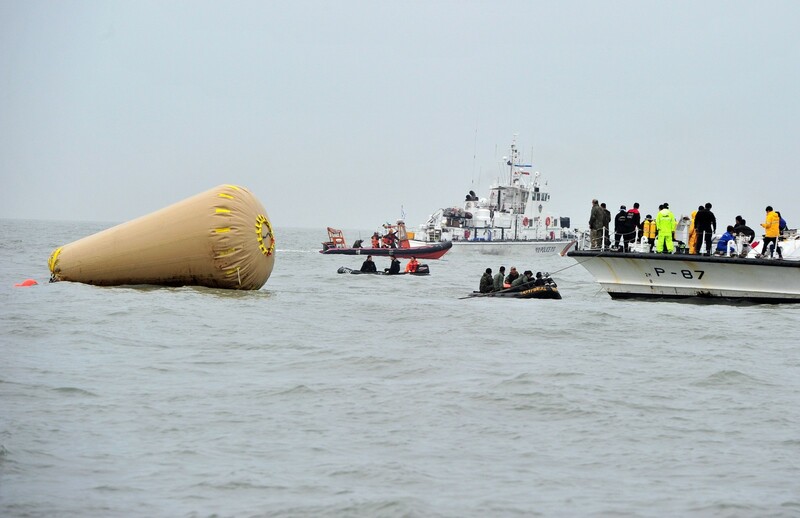 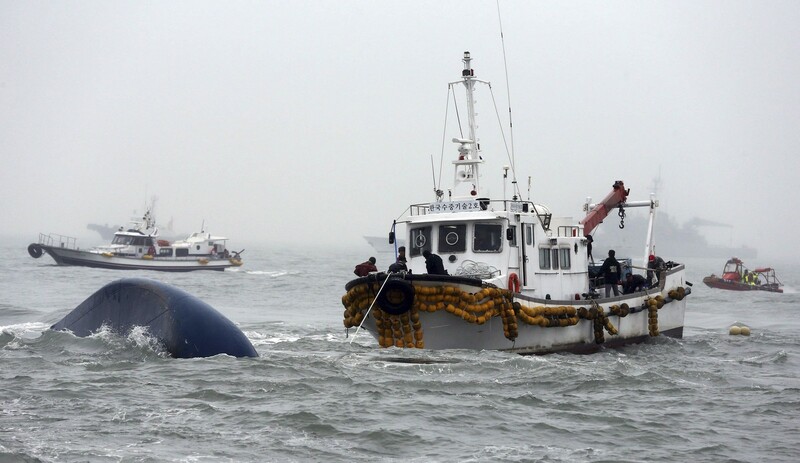 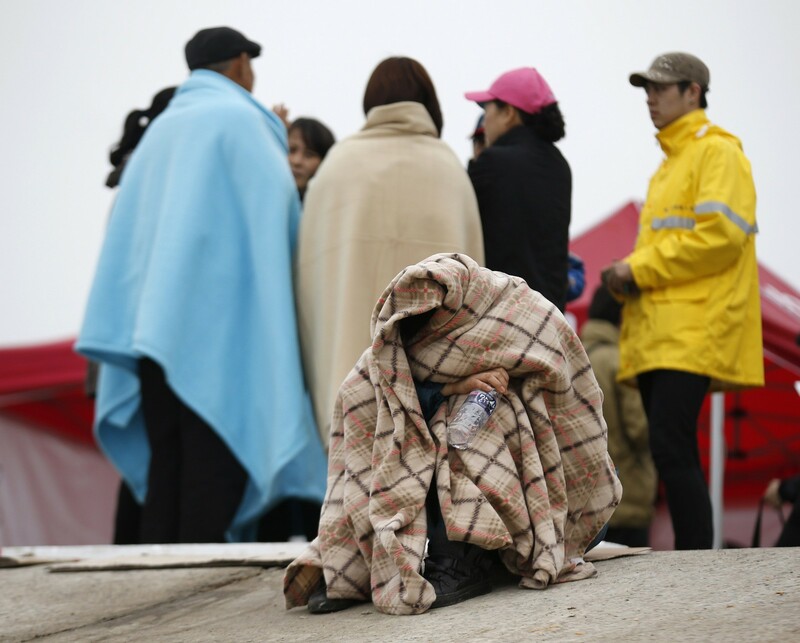 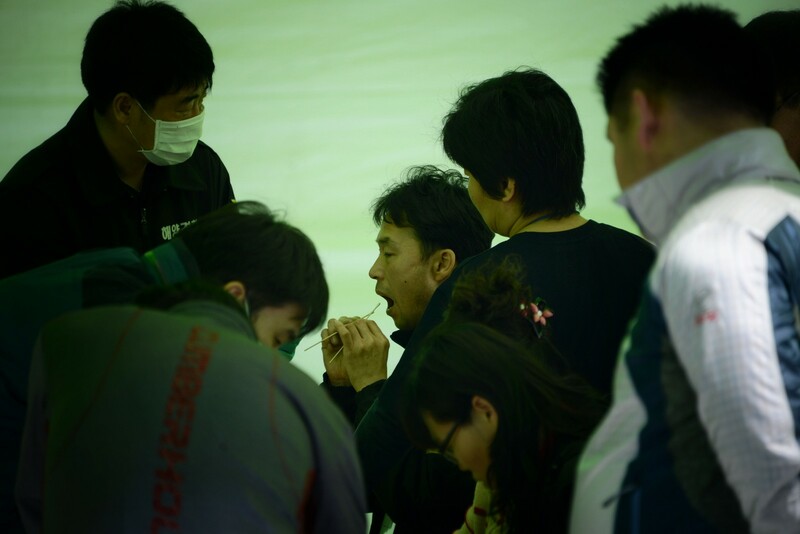 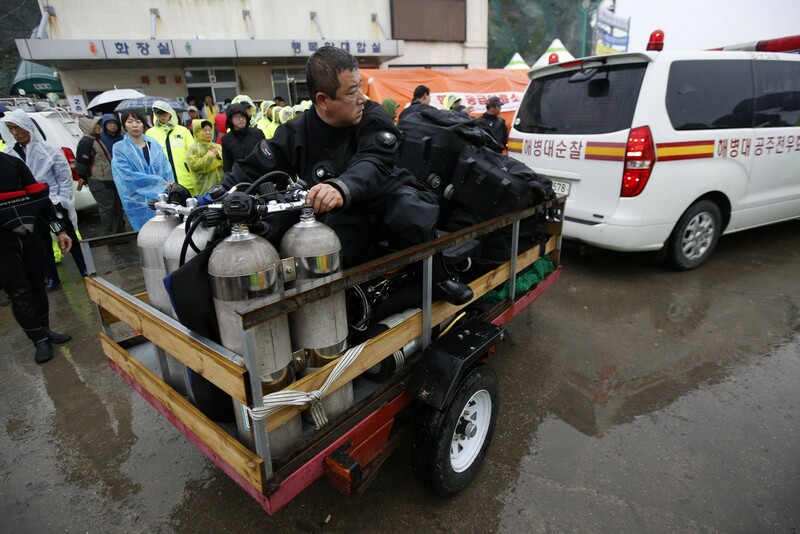 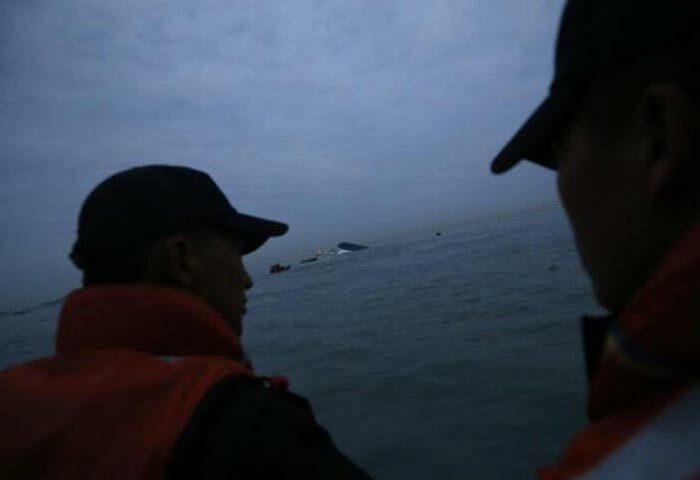 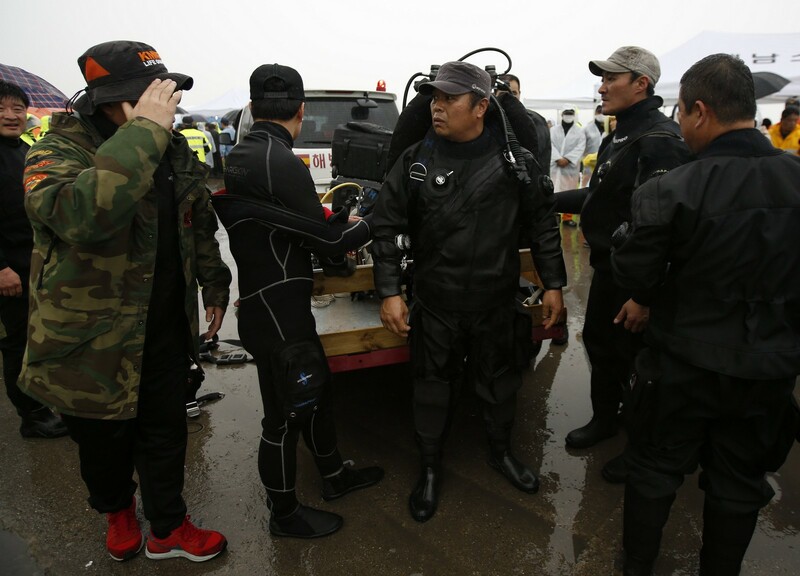 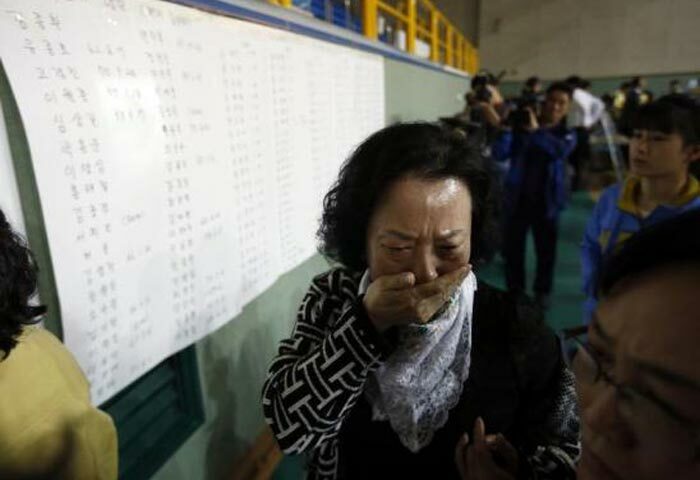 The first clear indication of the volatile mood came when South Korean Prime Minister Chung Hong-Won visited anguished relatives of the missing the morning after the 6,825-tonne Sewol capsized and sank. 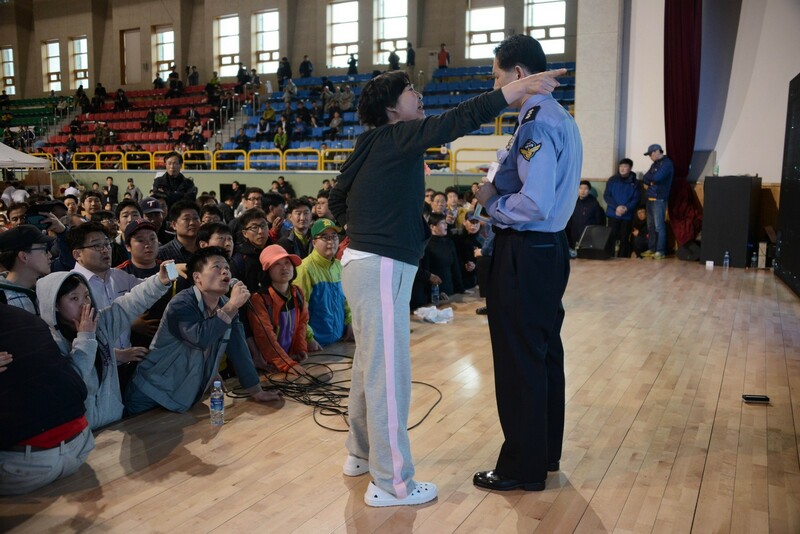 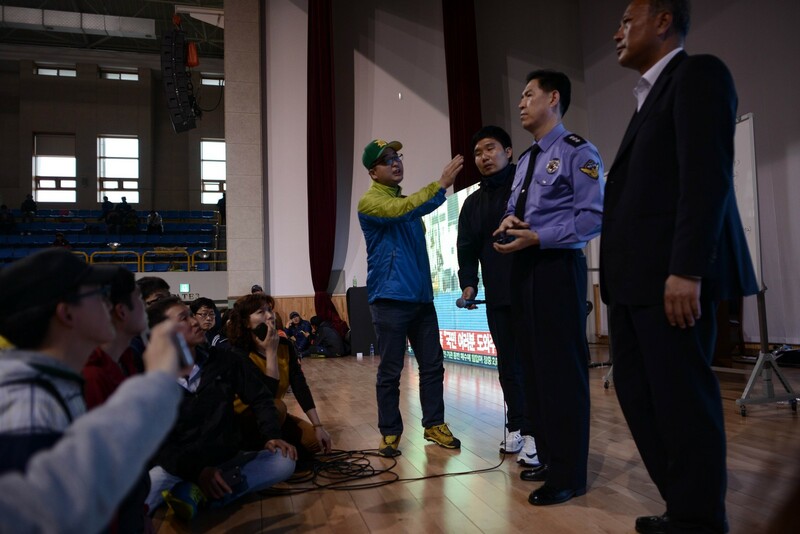 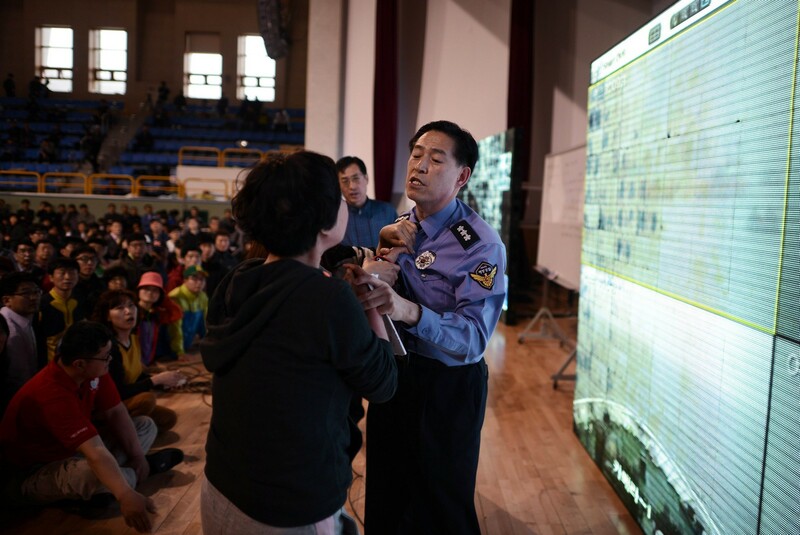 In the gymnasium where the families were sheltering in Jindo island, Chung was jostled, pushed and shouted at, while some people threw water bottles at him. 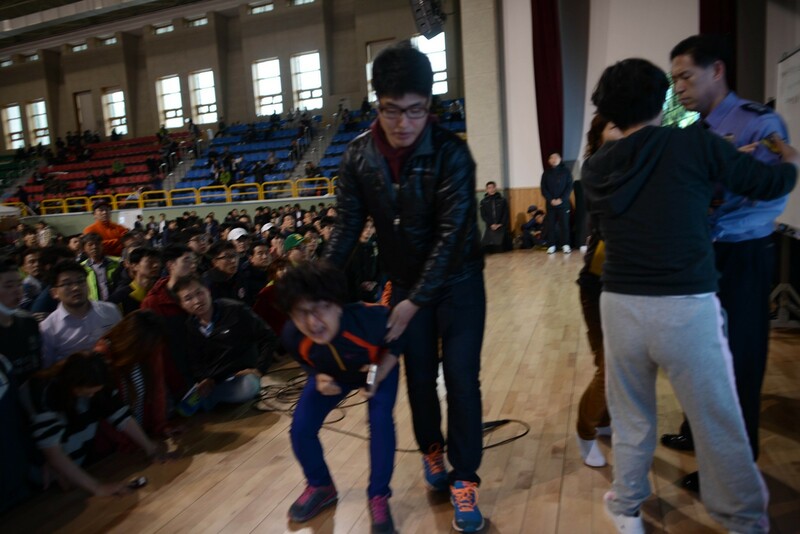 "Don't run away, Mr. Prime Minister!" 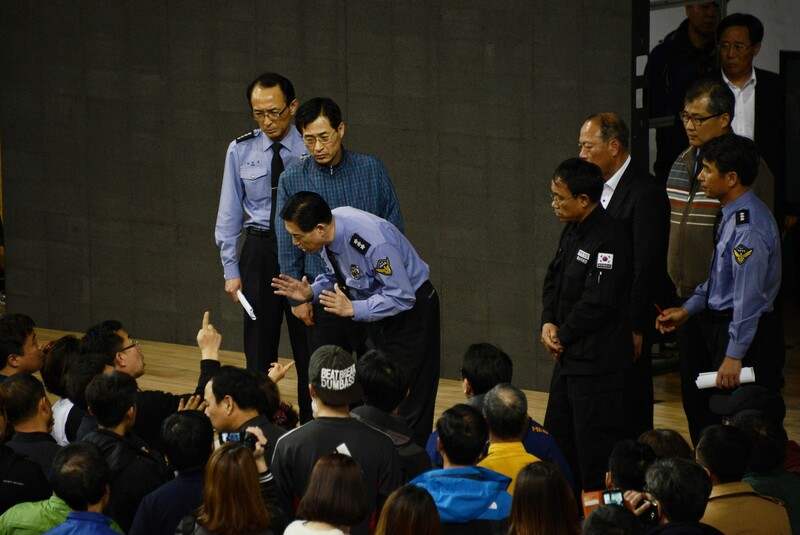 said one irate mother, blocking Chung as he tried to leave. 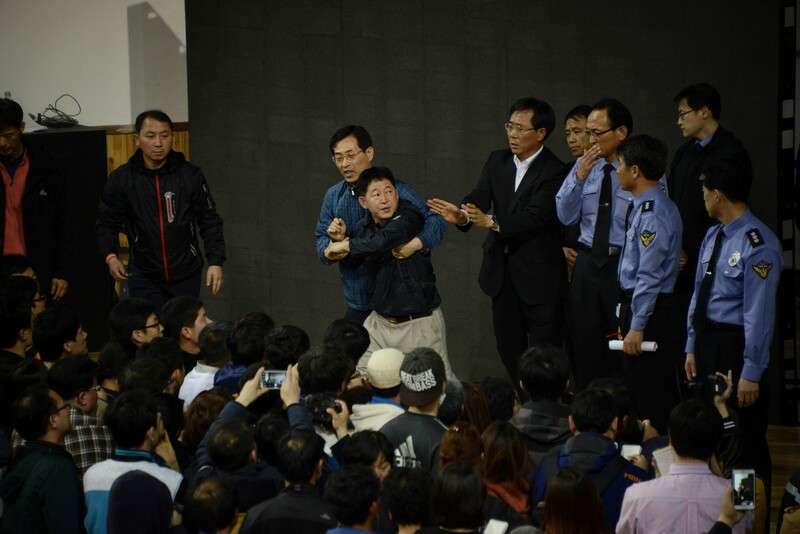 The anger was not so much with Chung personally but with the idea that not enough was being done and that he represented the responsible authority. 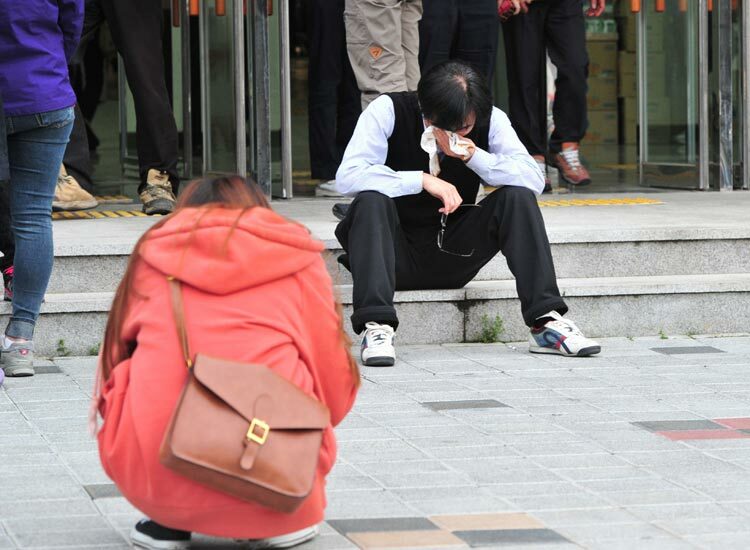 With emotions sky-high and the language of blame getting harsher by the day, it quickly became clear there would be no quarter given to anyone perceived as speaking or acting out of place - even indirectly. 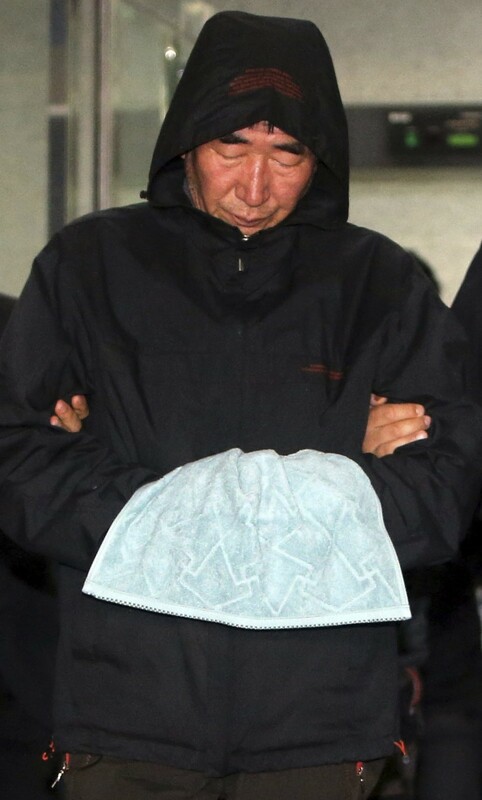 Chung Mong-Joon, a veteran lawmaker who is running for Seoul mayor this year, felt forced to make a live TV apology after his son wrote a Facebook post criticising the "uncivilised" behaviour of the bereaved relatives in jostling the prime minister and, on a later occasion, heckling President Park Geun-Hye. 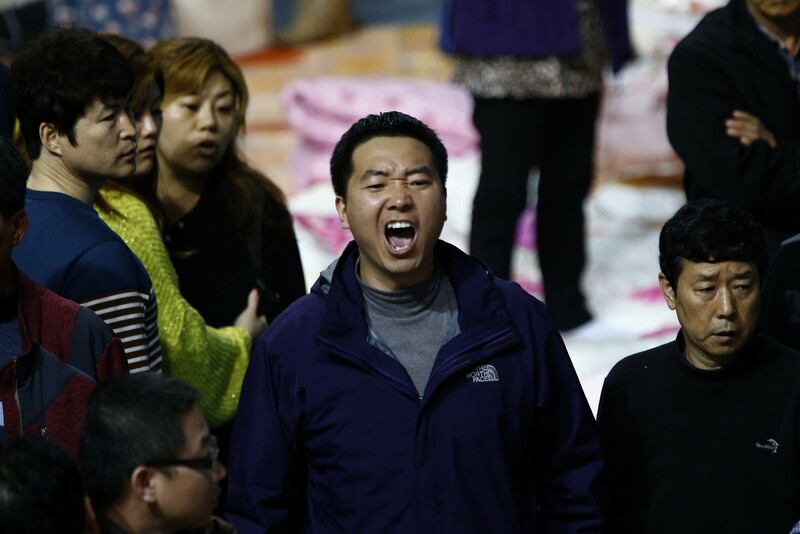 "I am deeply sorry for my son's childish behaviour," Chung said, after the post prompted an apoplectic public backlash. 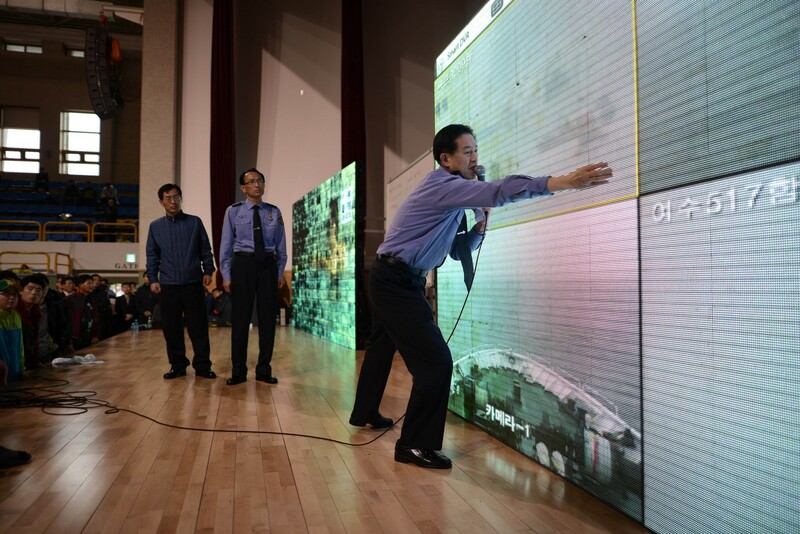 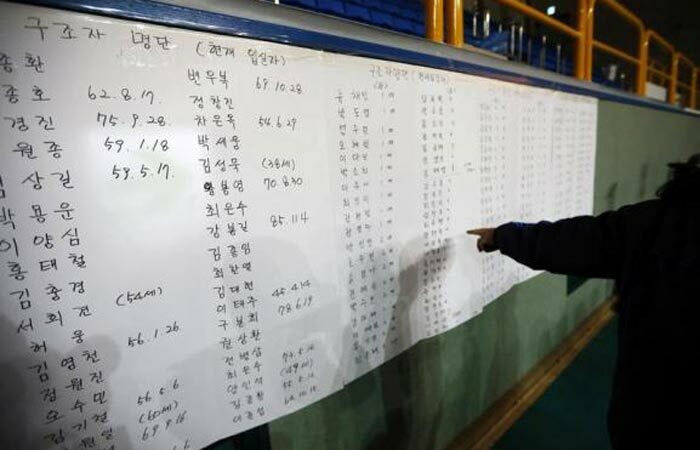 Next came Song Young-Chul, a director-level official at the ministry tasked with disaster response, who posed for a picture in front of a bulletin board listing the names of the dead. 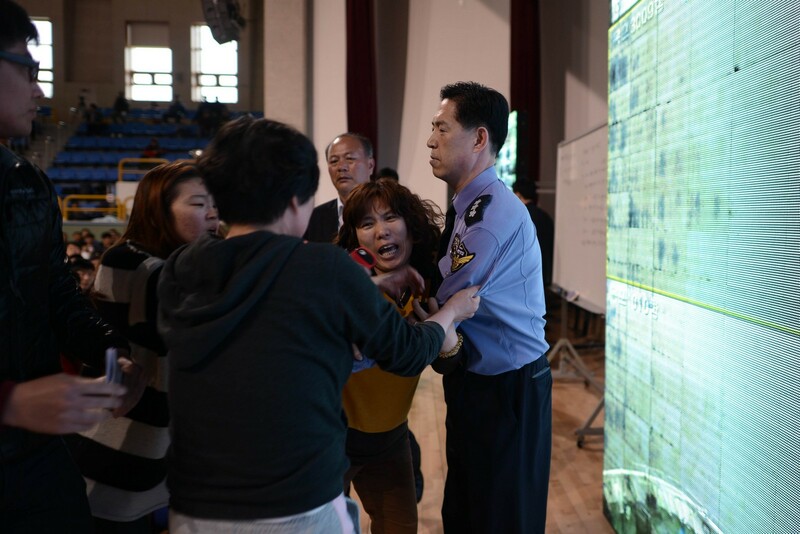 He was spotted and confronted by angry relatives, and ended up offering his resignation - which, given the tinderbox atmosphere, was immediately accepted. 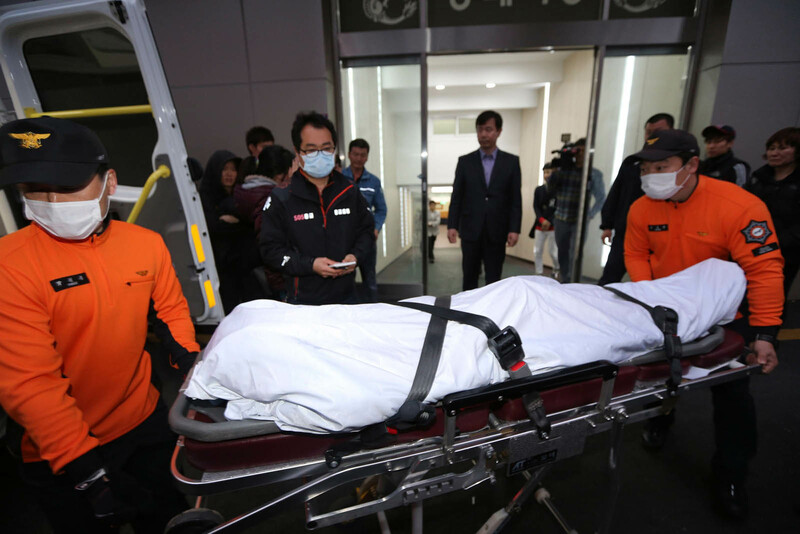 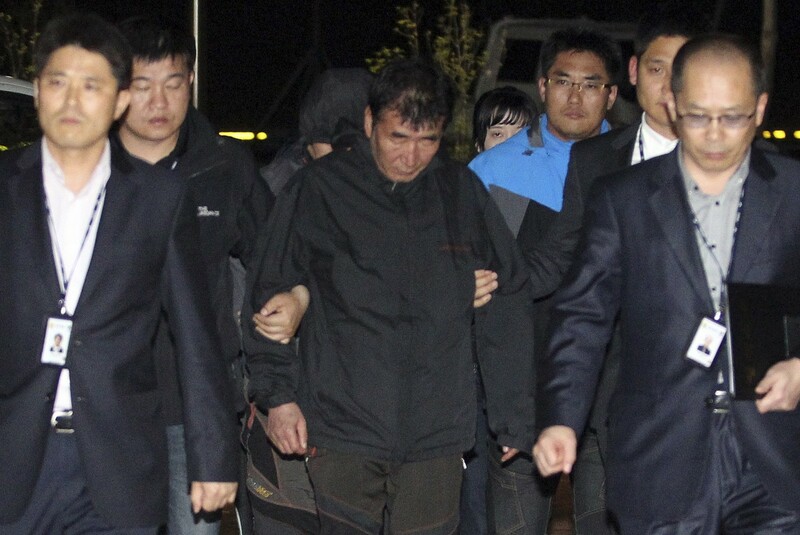 Education Minister Seo Nam-Soo, meanwhile, was twice accused of inappropriate behaviour; once indirectly after an aide was deemed to have made too much of the minister's imminent arrival at a funeral for one of the many students killed in the ferry capsize. 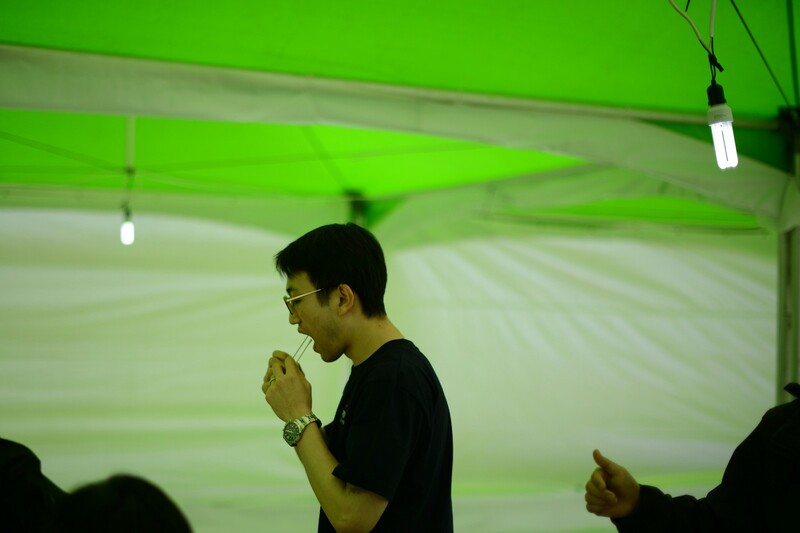 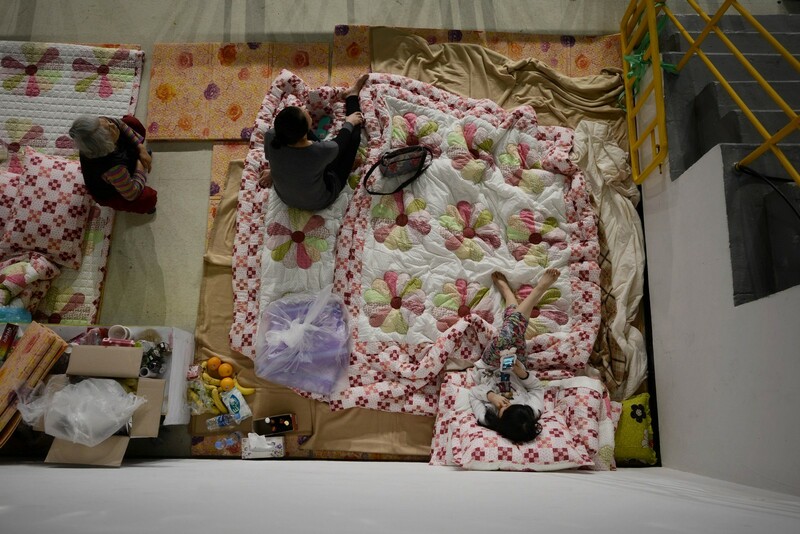 On another occasion he was slammed after a picture emerged of him eating cup noodles while sitting on a chair in the gymnasium on Jindo island where the relatives have been camping out for the past week. 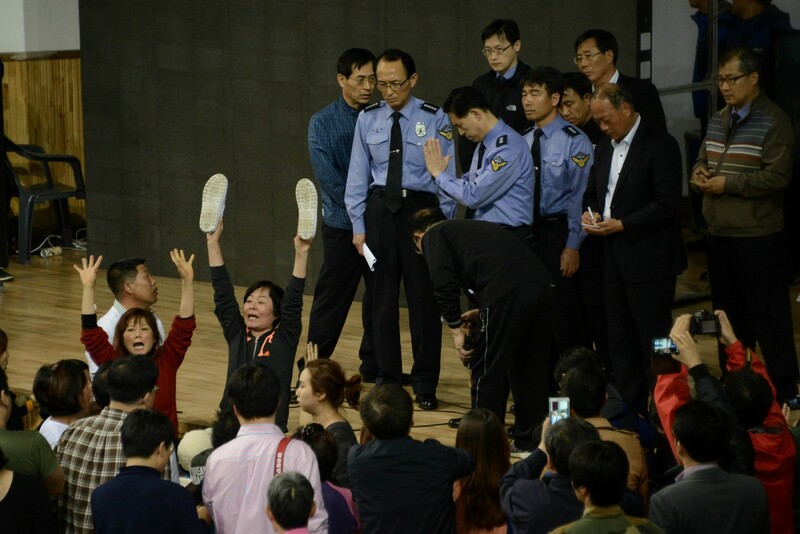 Seo was sharply criticised for using a chair while the relatives were sleeping on the floor. 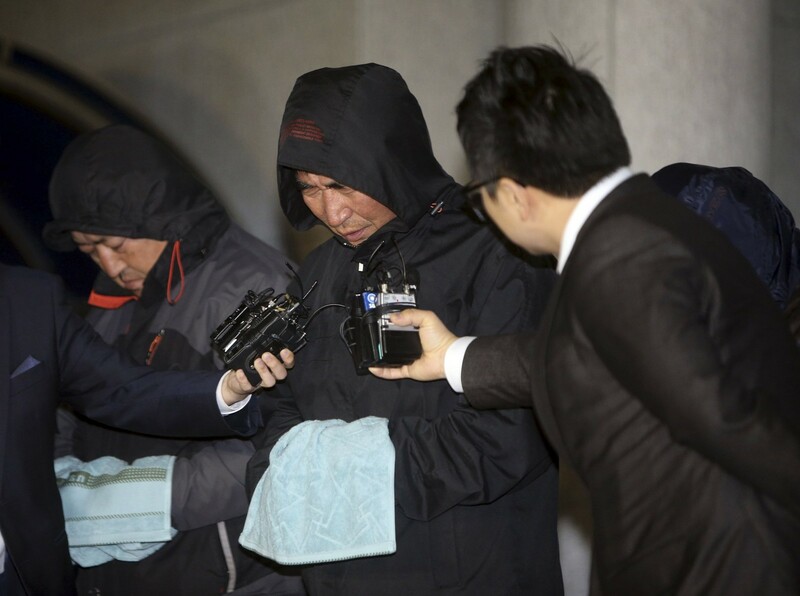 "It became a problem because it was an armchair and it was photographed and because of the prevailing public sentiment," presidential Blue House spokesman Min Kyung-Wook told reporters. 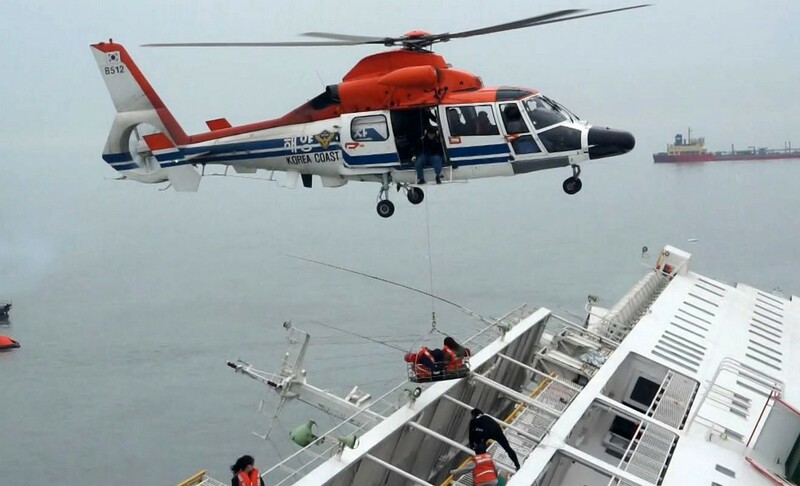 Meanwhile, a senior coastguard official was sacked for suggesting the coastguard had done well to rescue 80 people from the ferry before it sank. 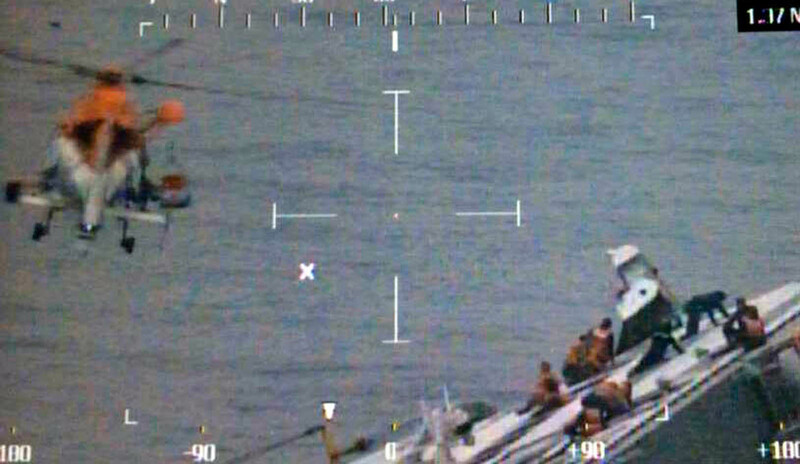 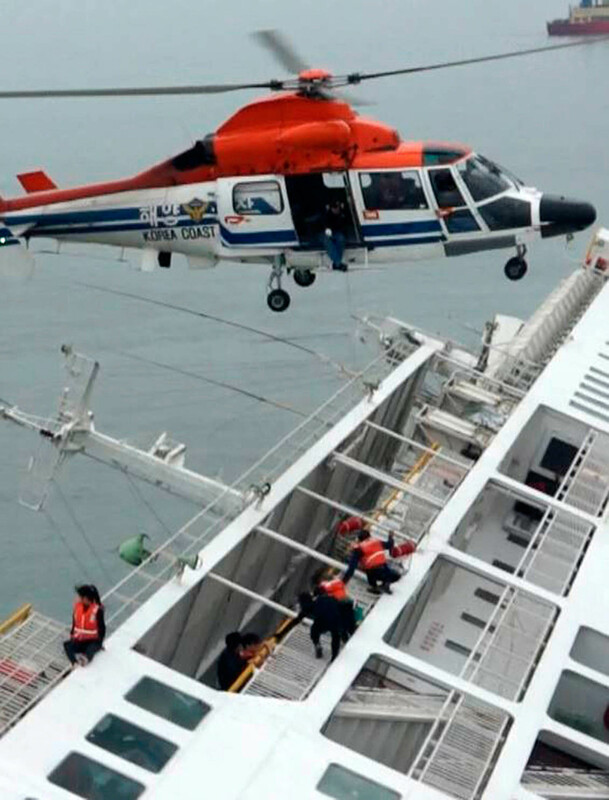 "His comment could hurt the families of the victims," the coastguard said in a statement announcing his dismissal. 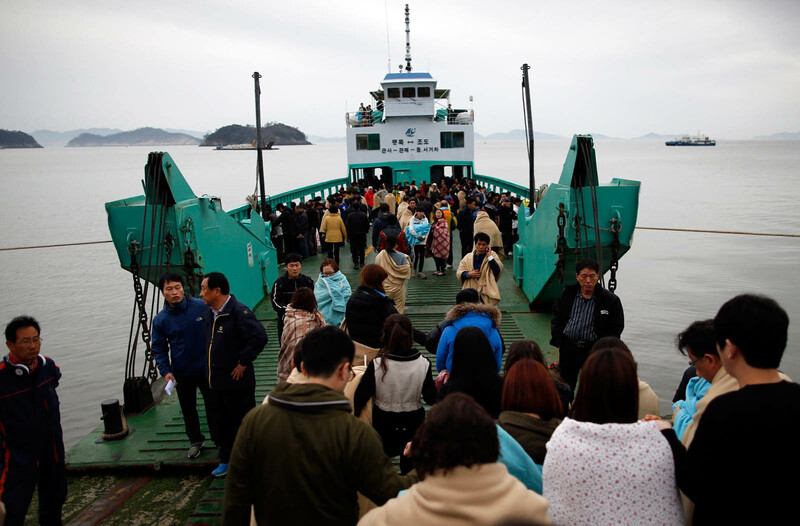 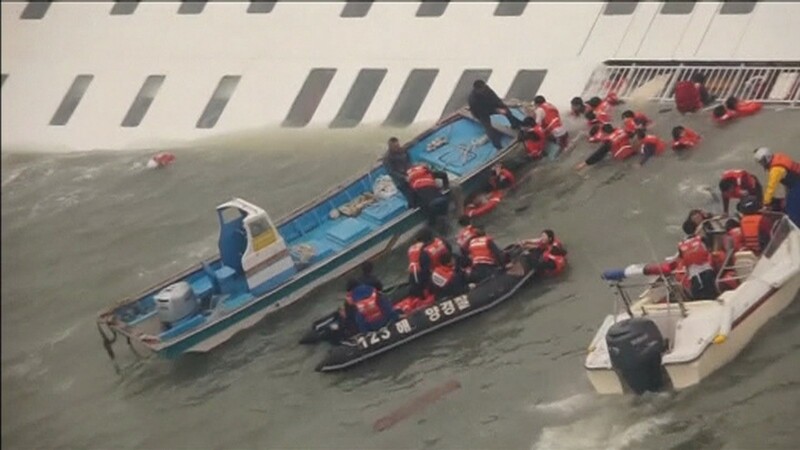 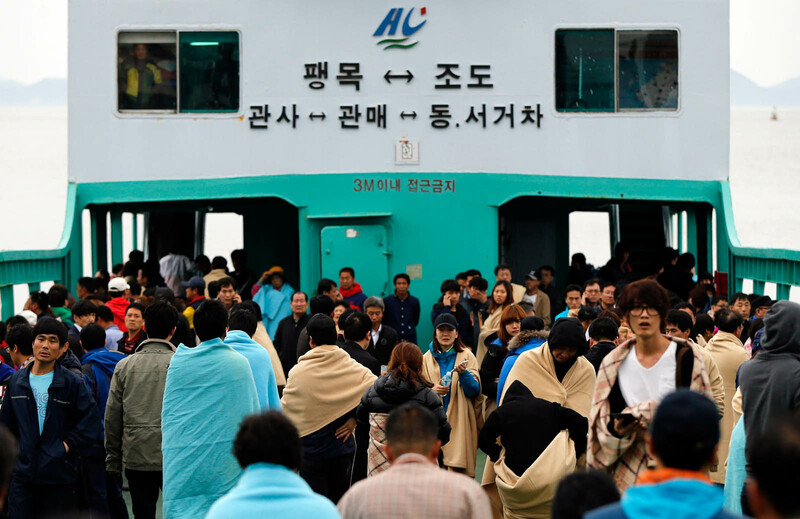 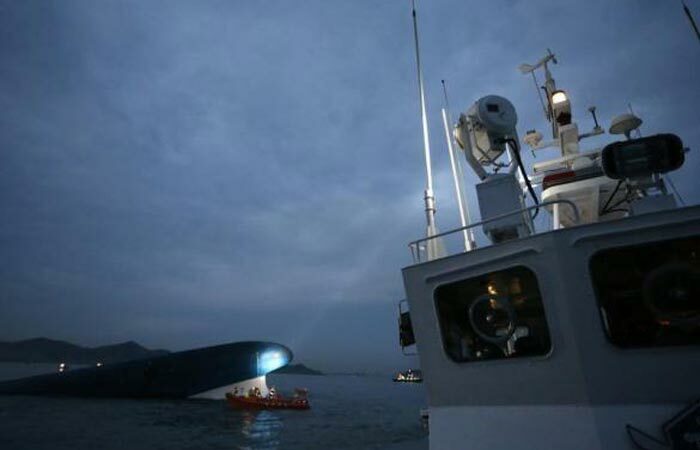 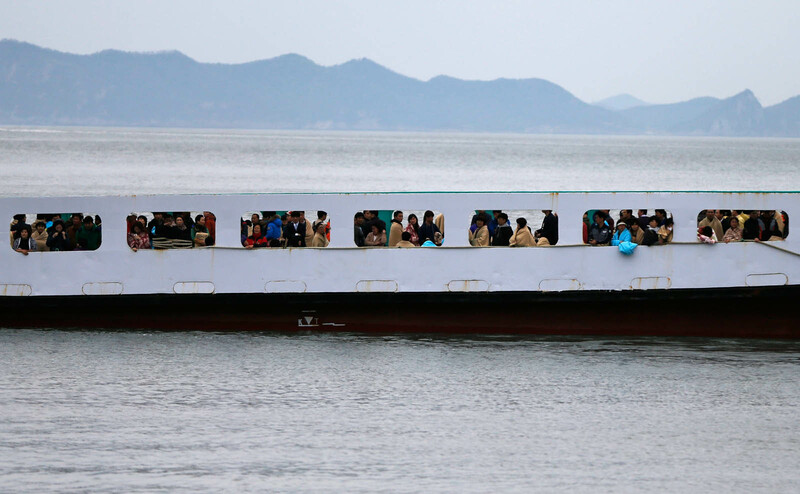 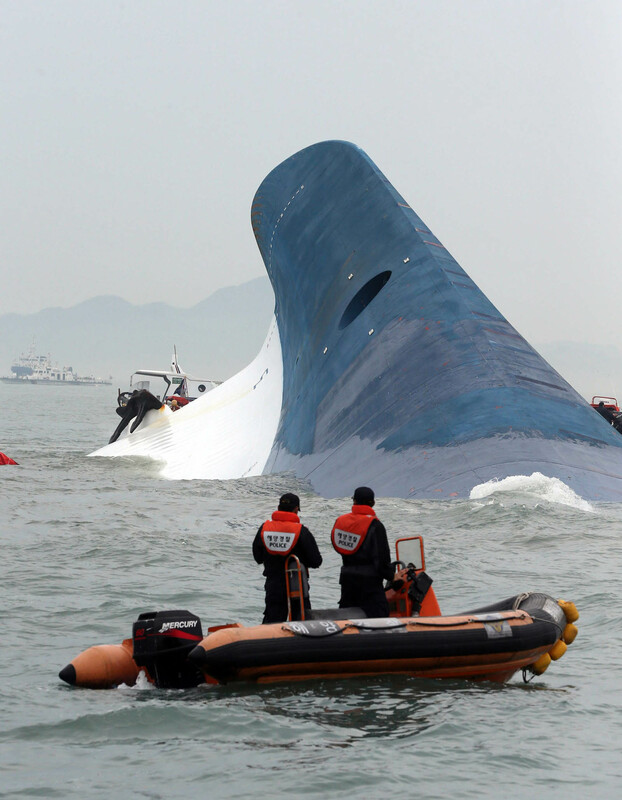 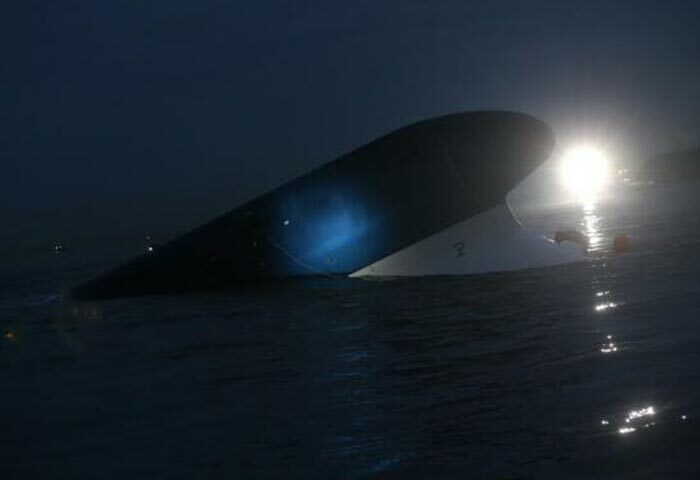 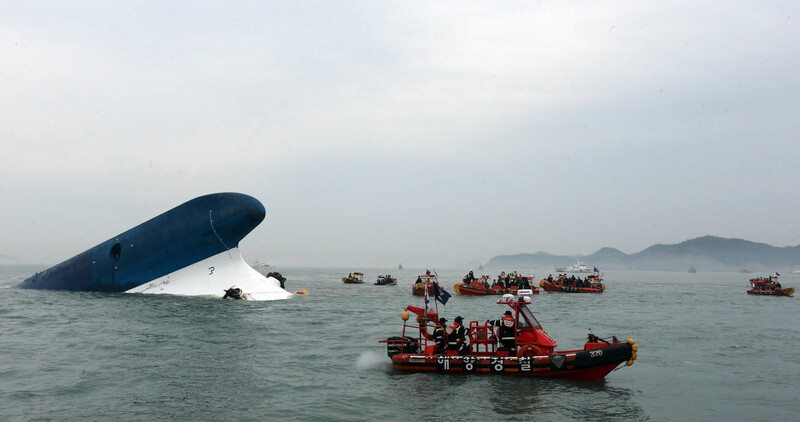 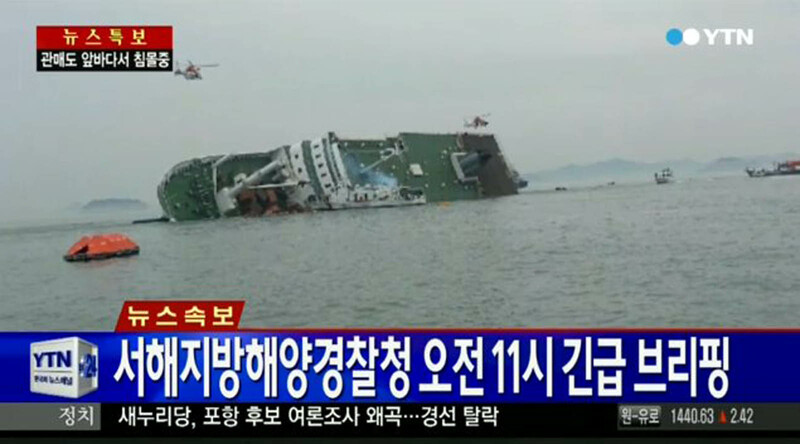 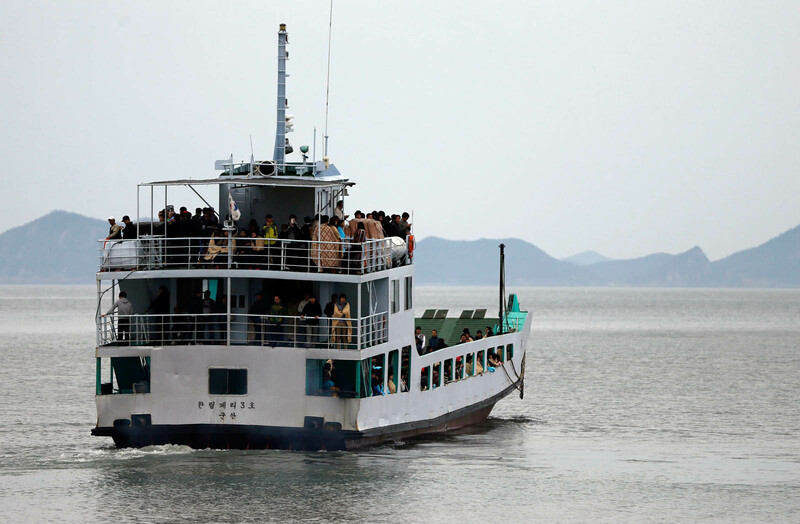 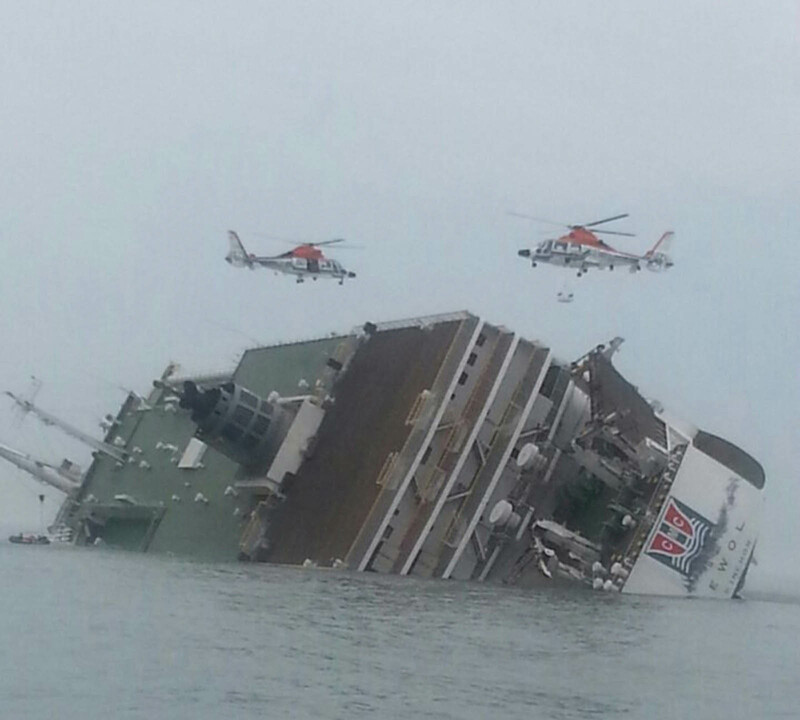 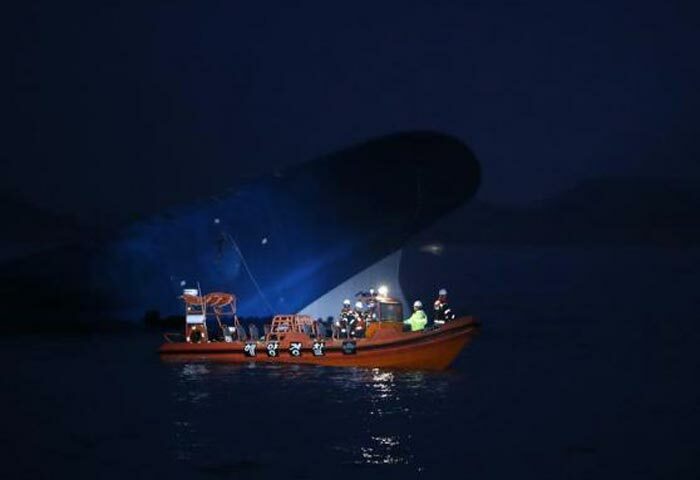 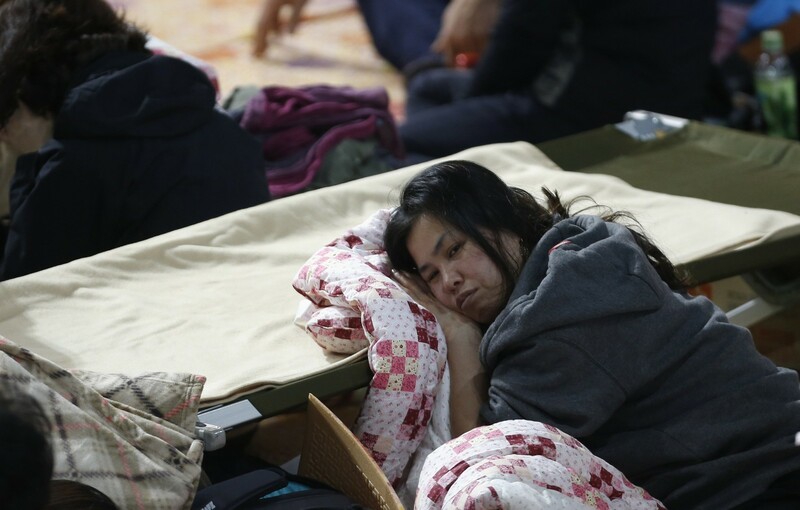 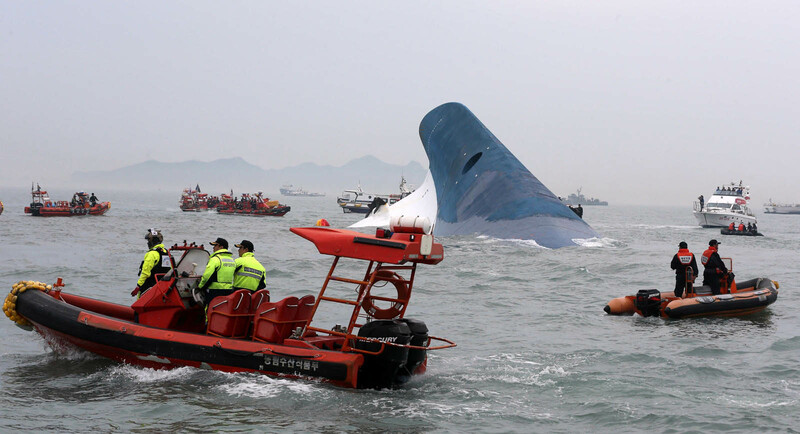 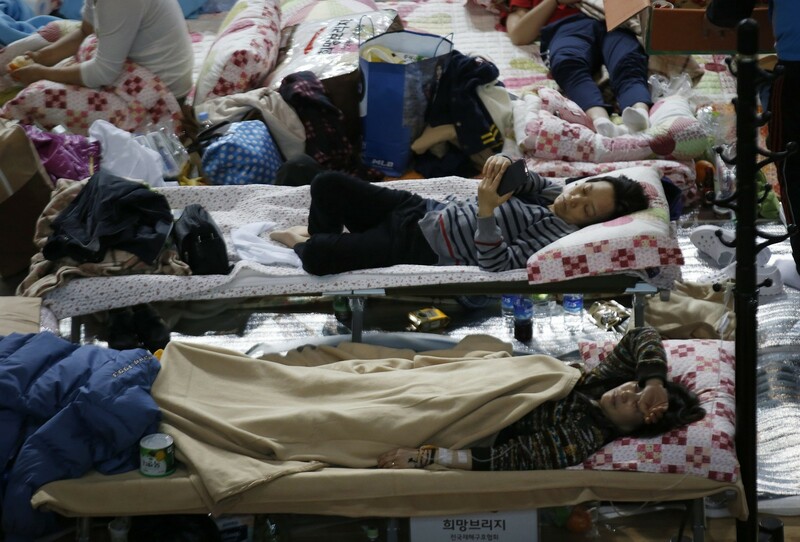 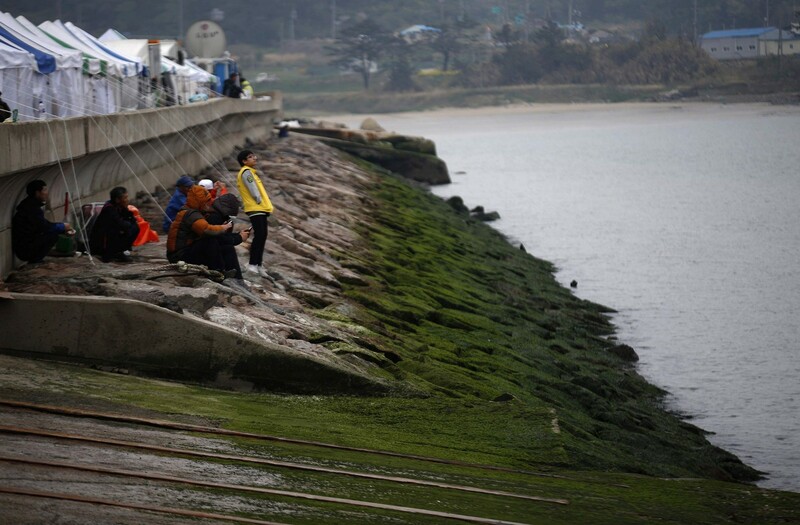 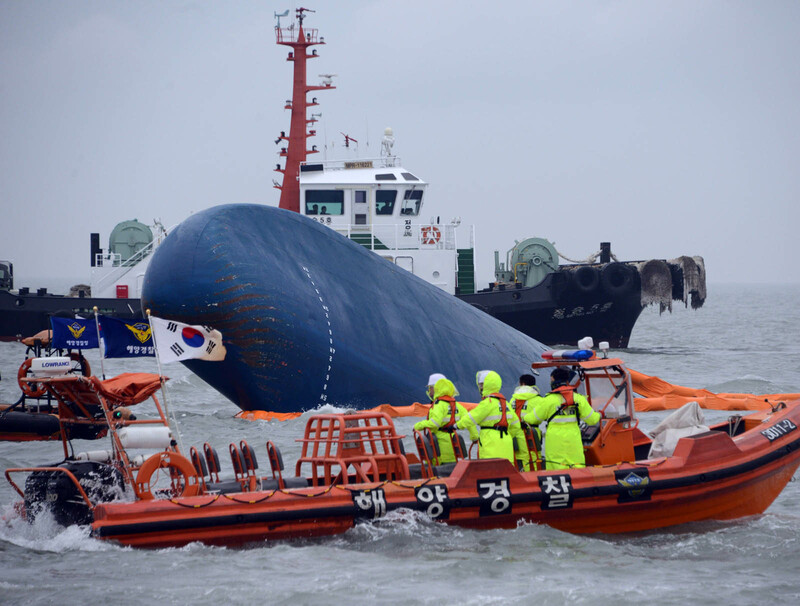 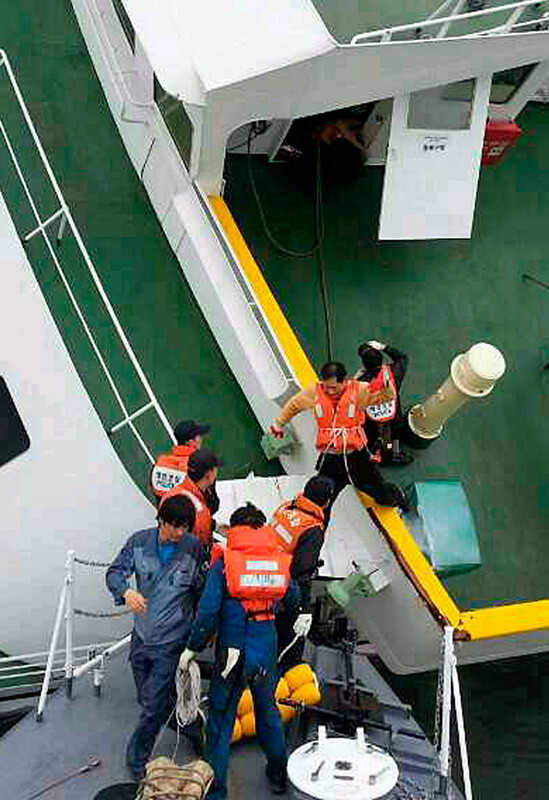 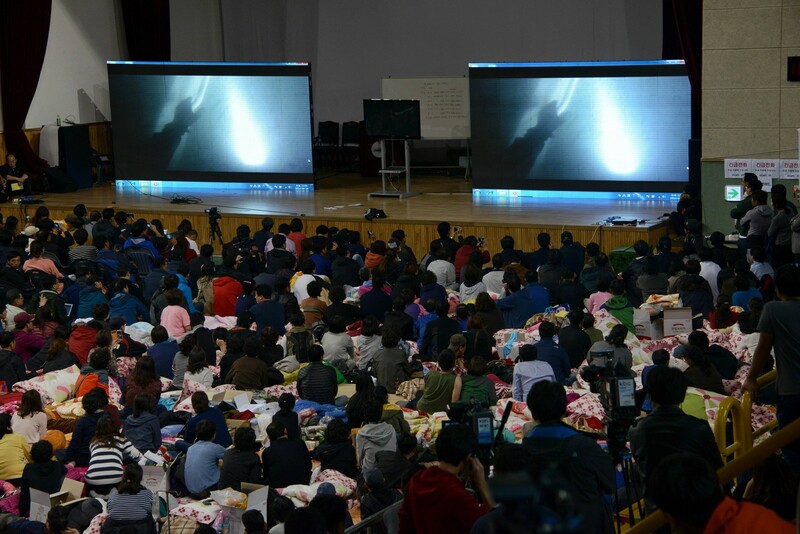 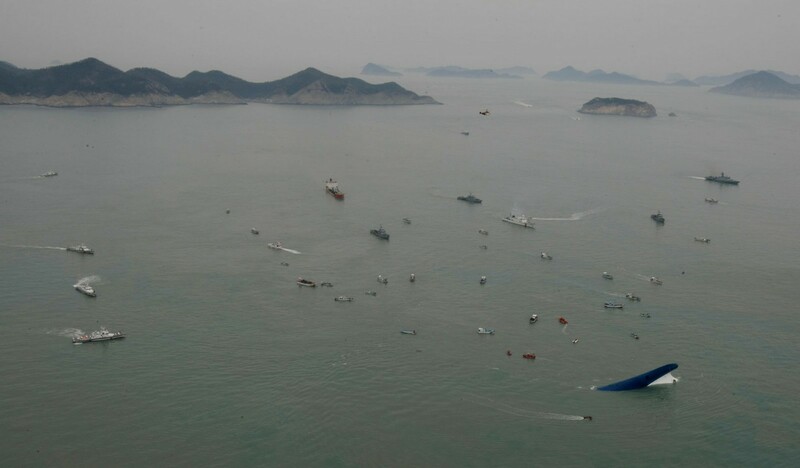 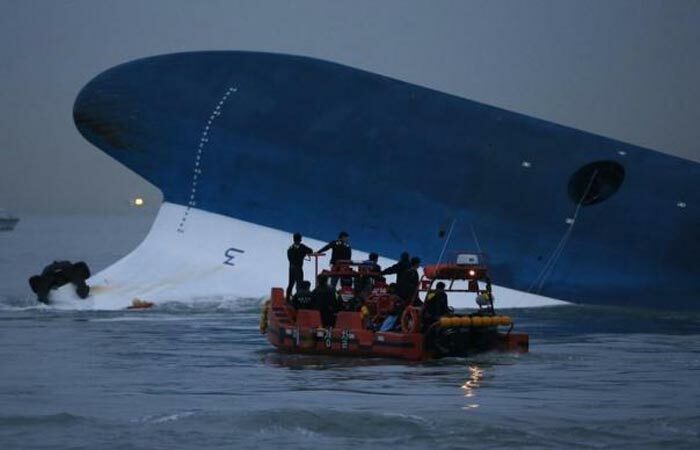 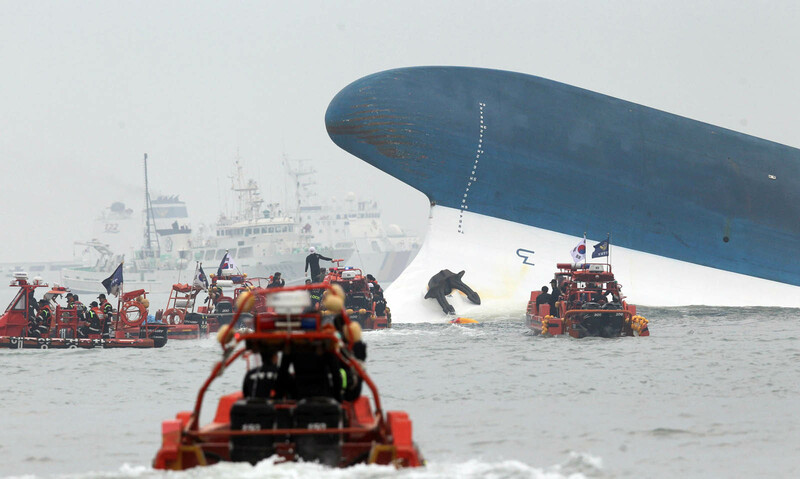 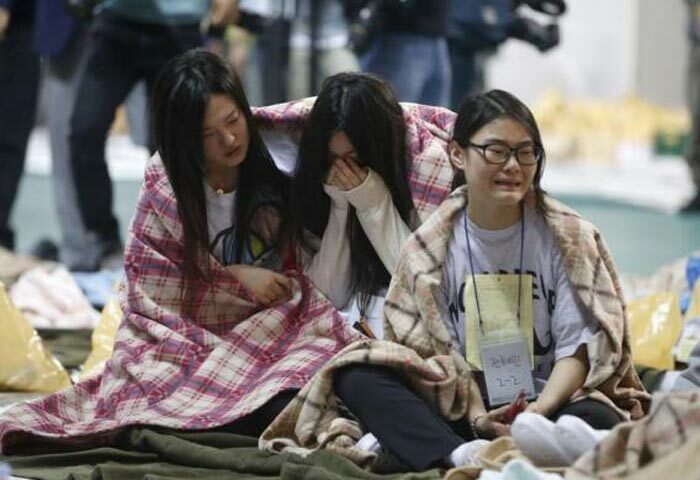 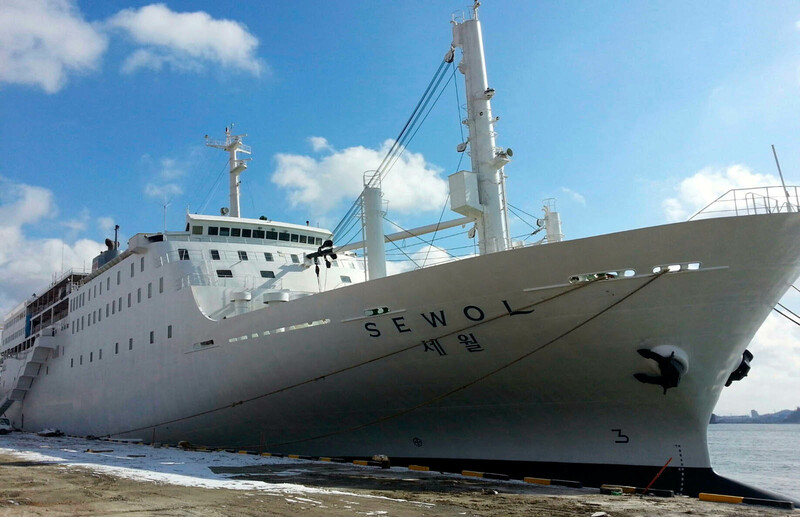 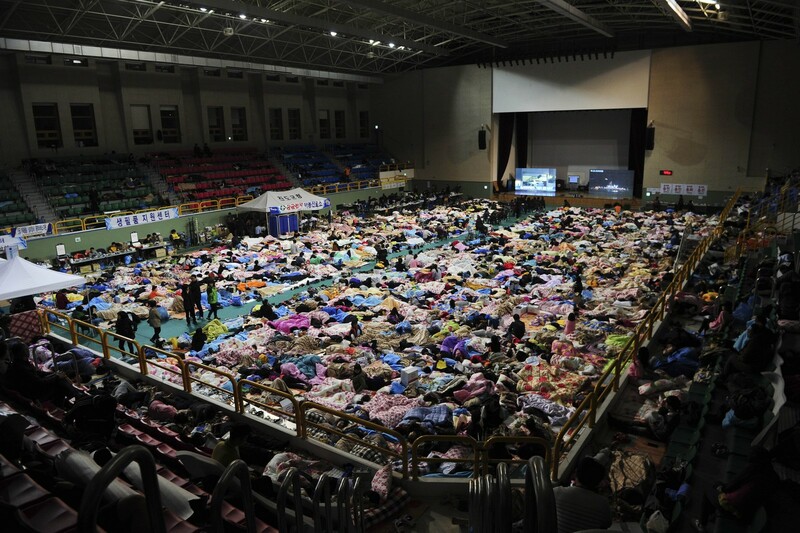 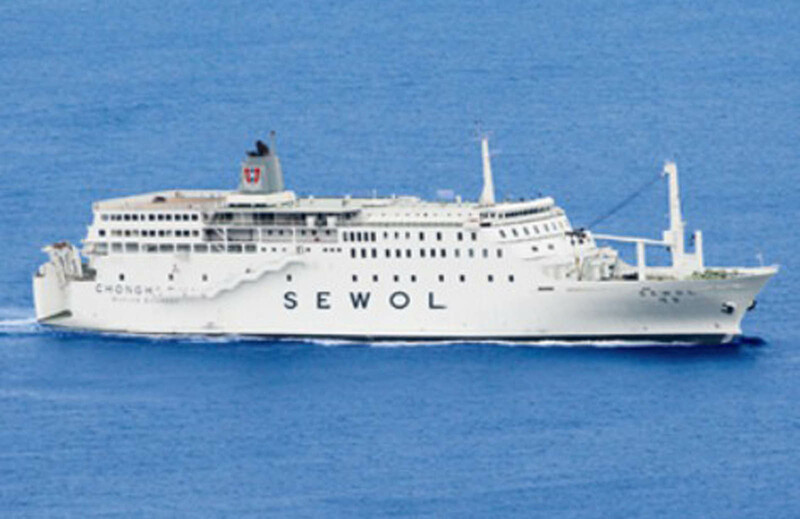 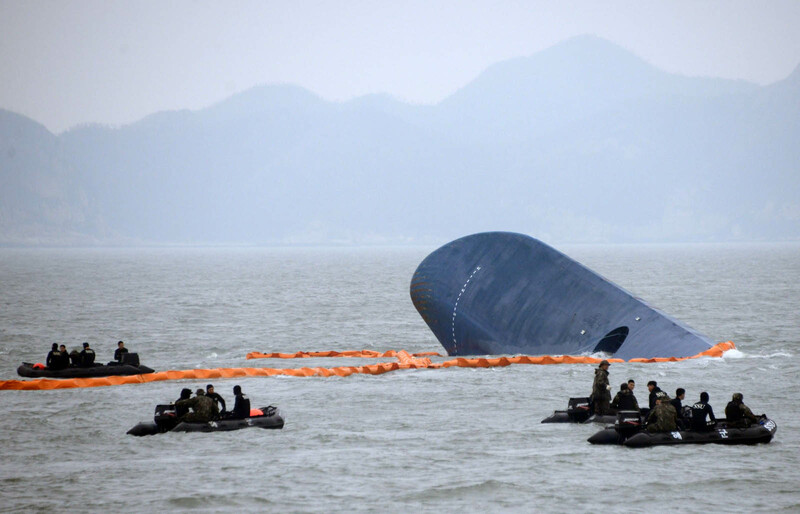 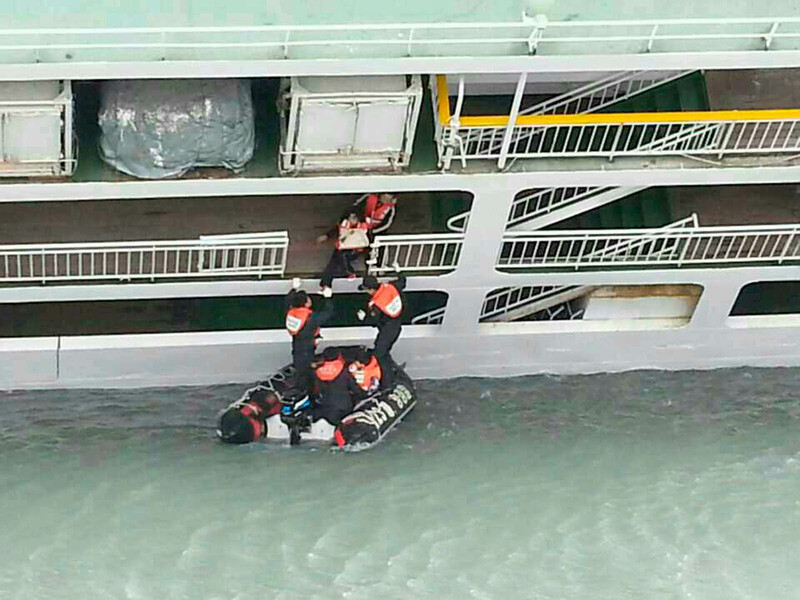 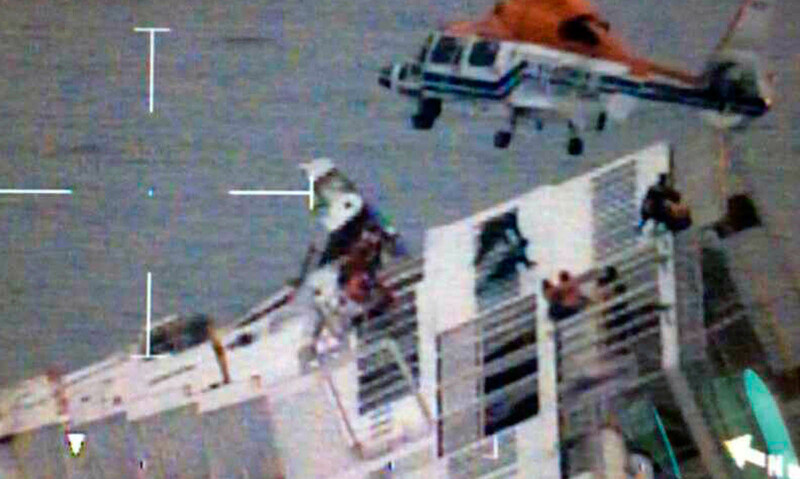 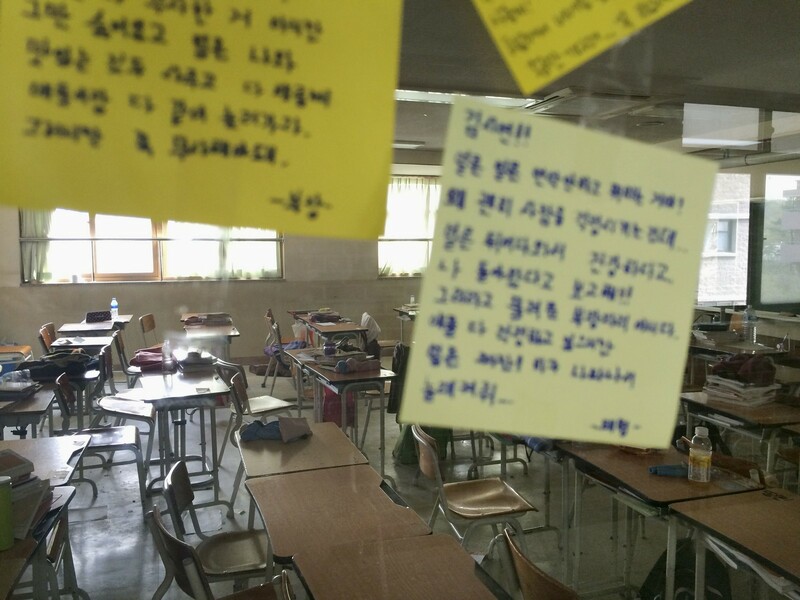 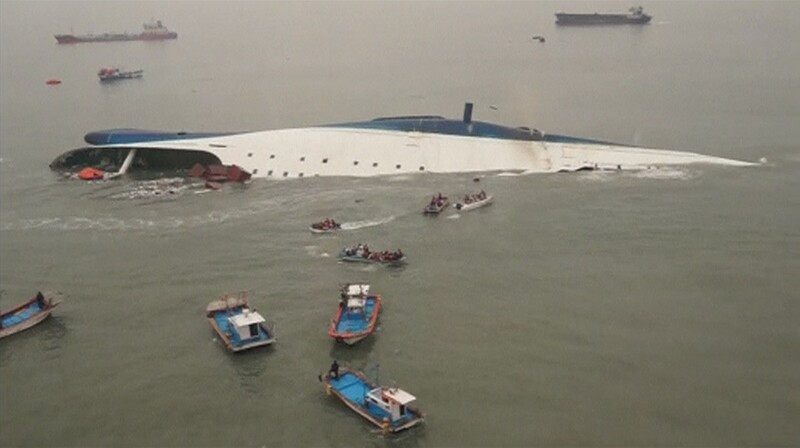 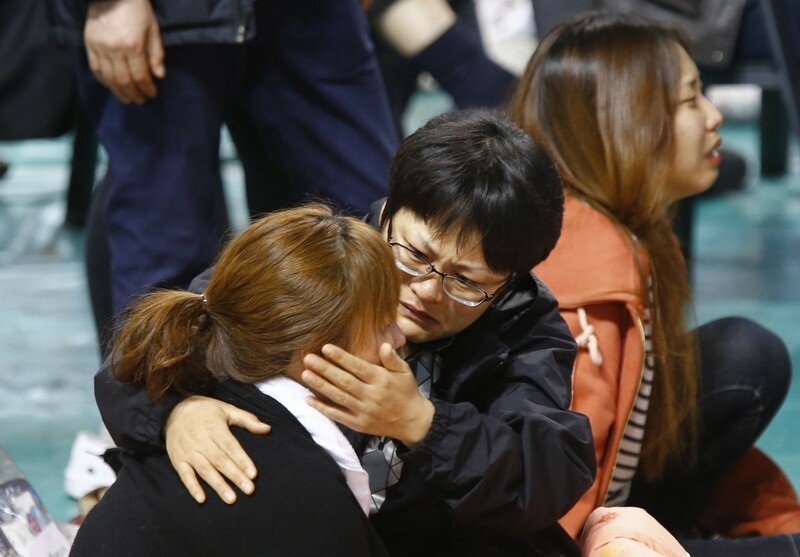 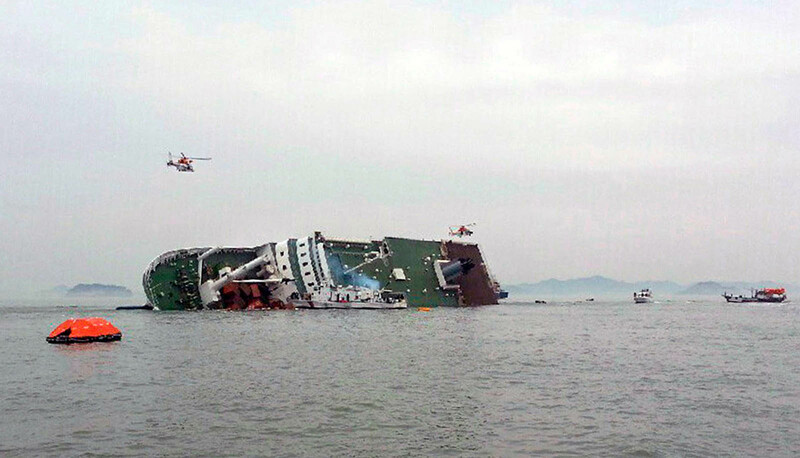 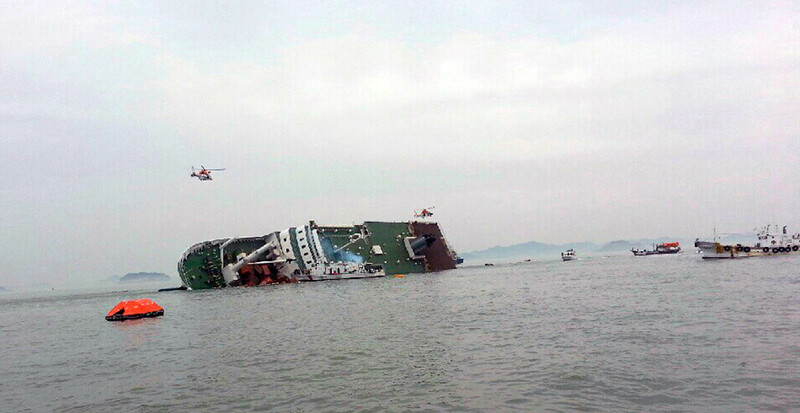 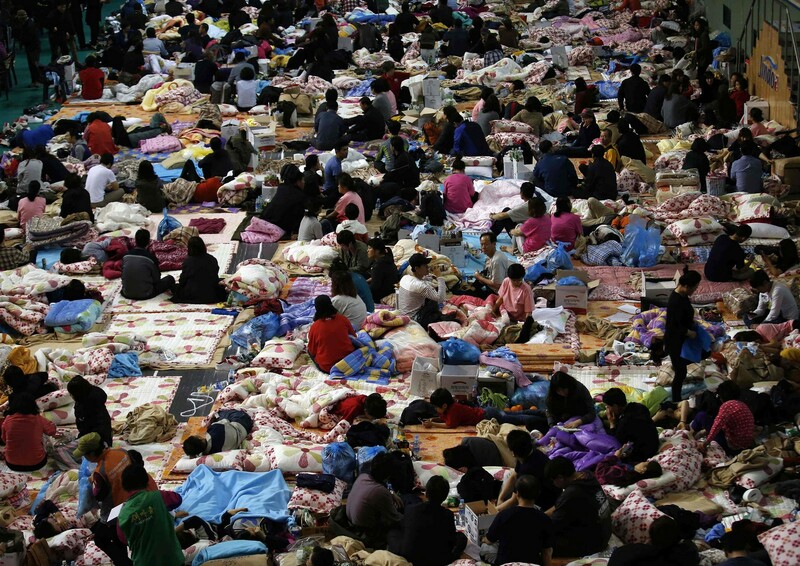 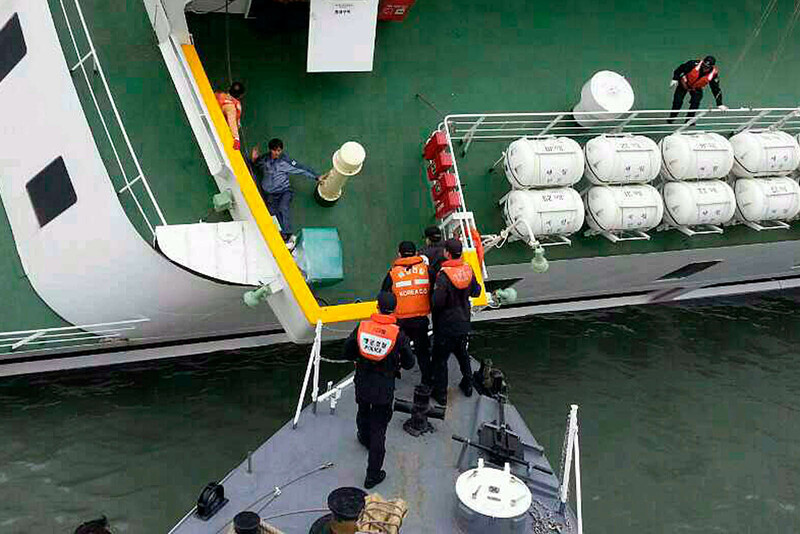 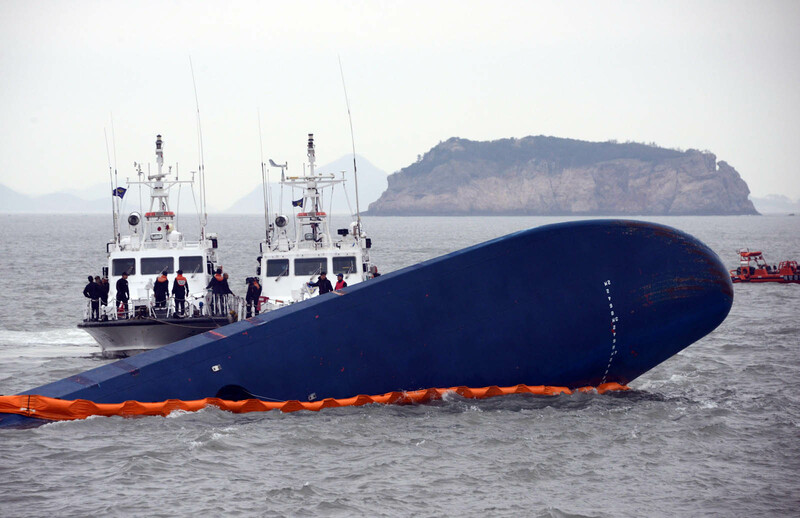 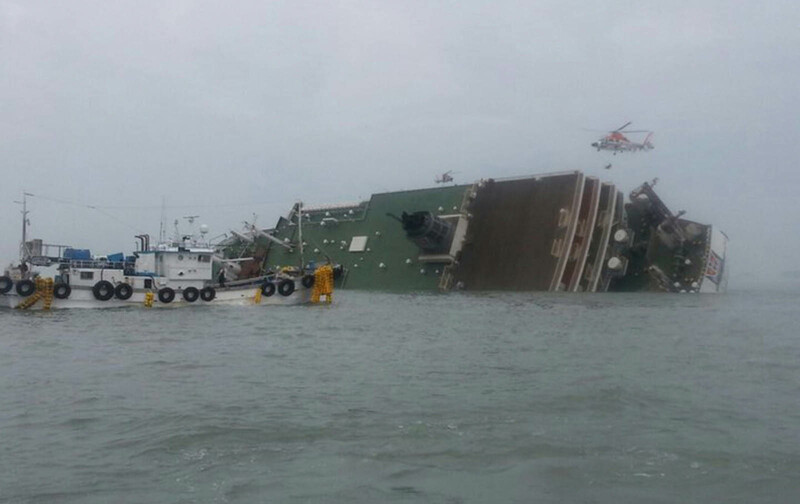 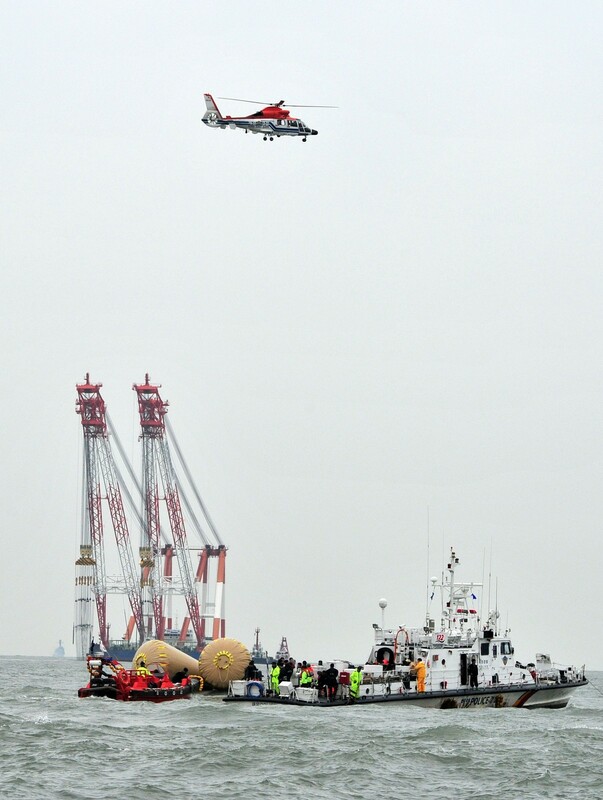 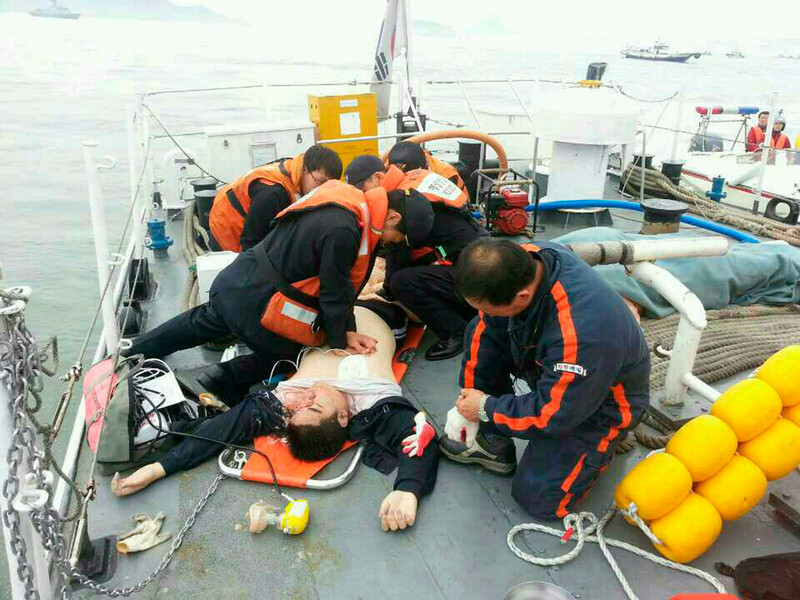 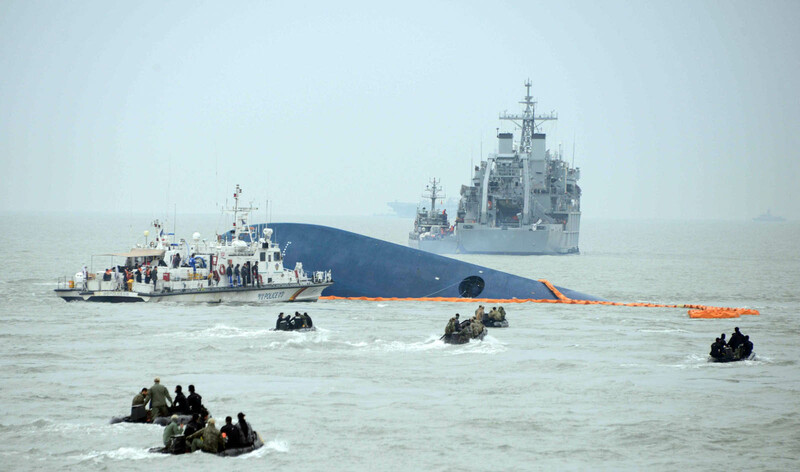 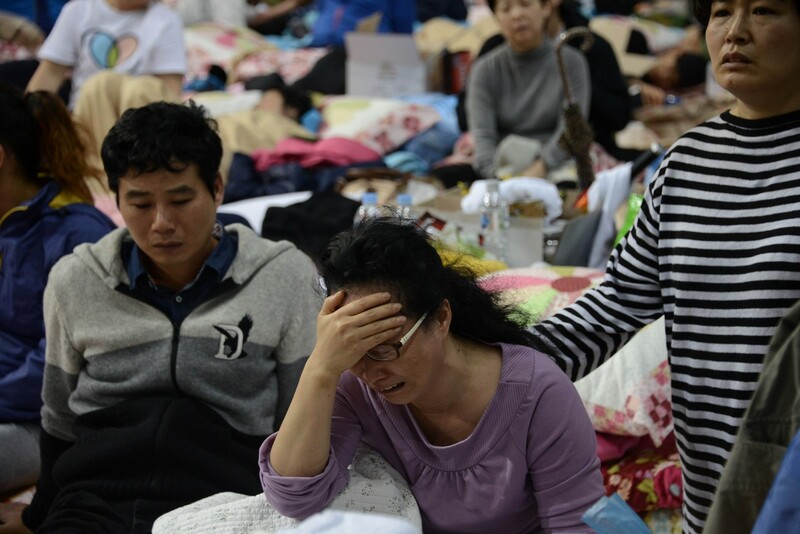 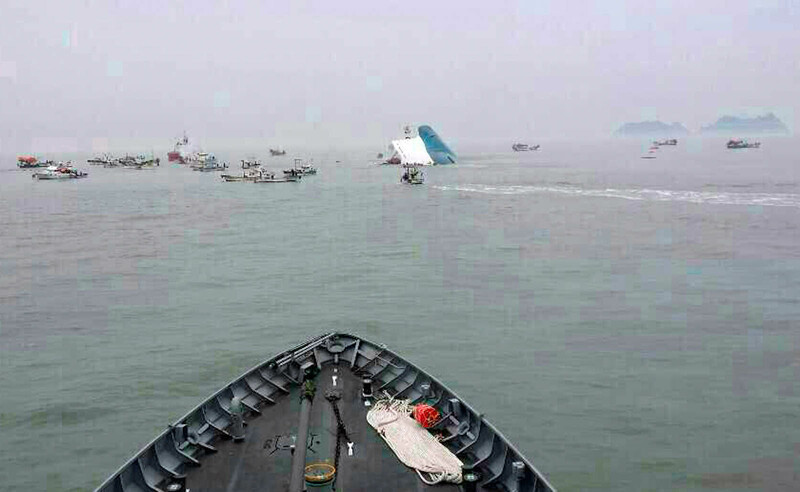 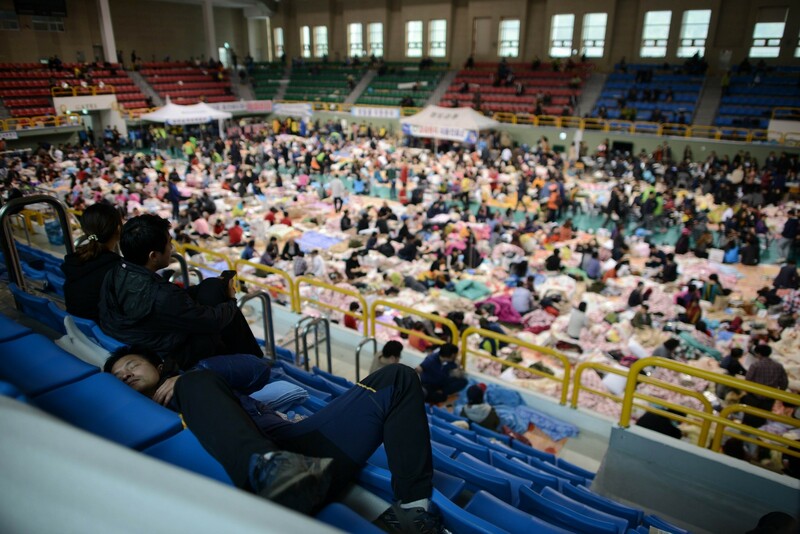 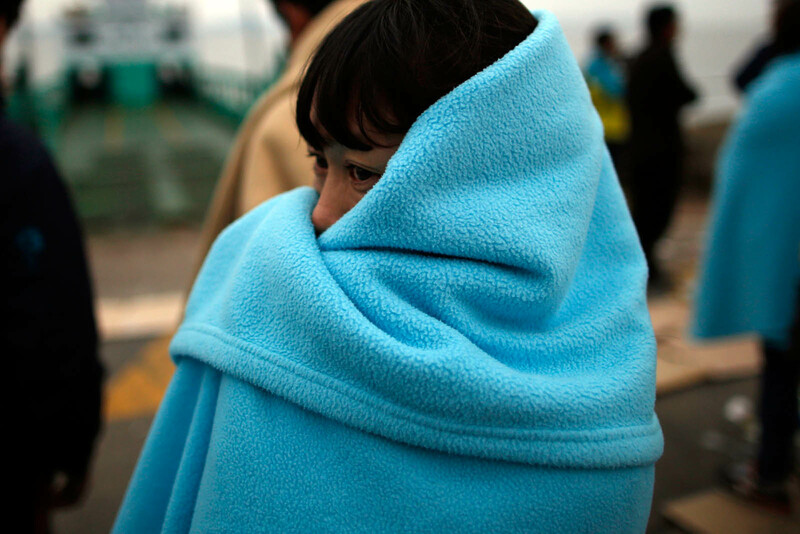 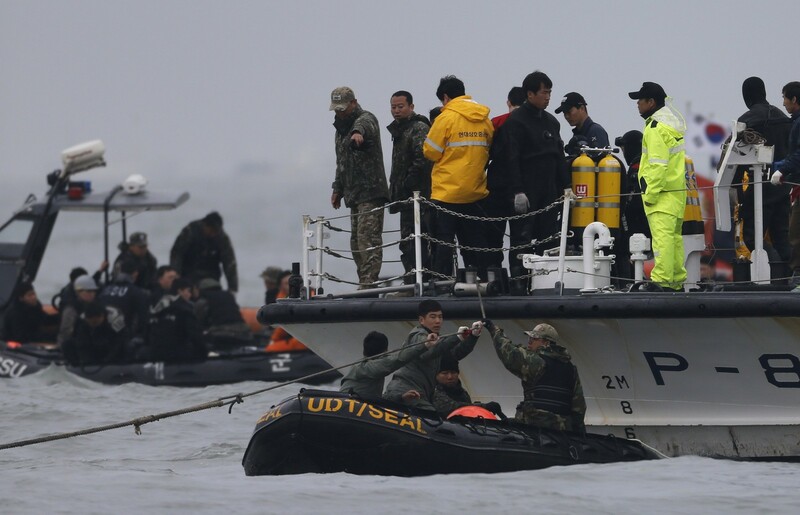 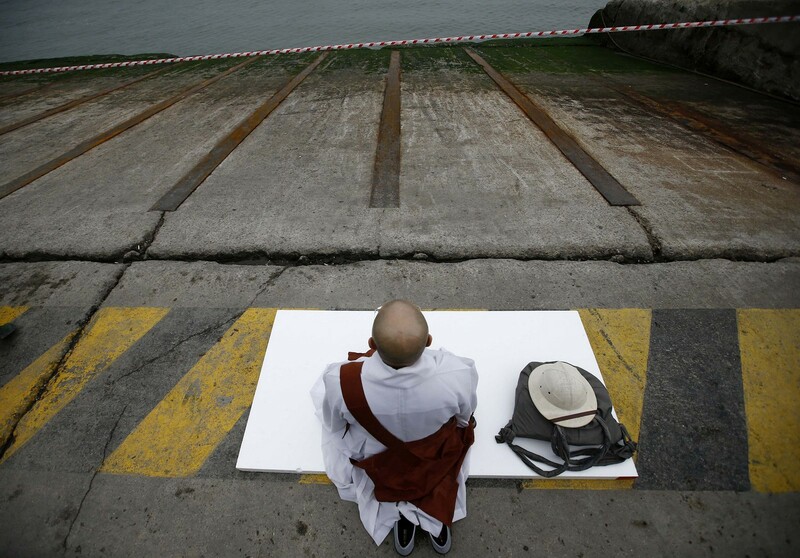 Of the 476 people on board the Sewol, only 174 managed to escape. 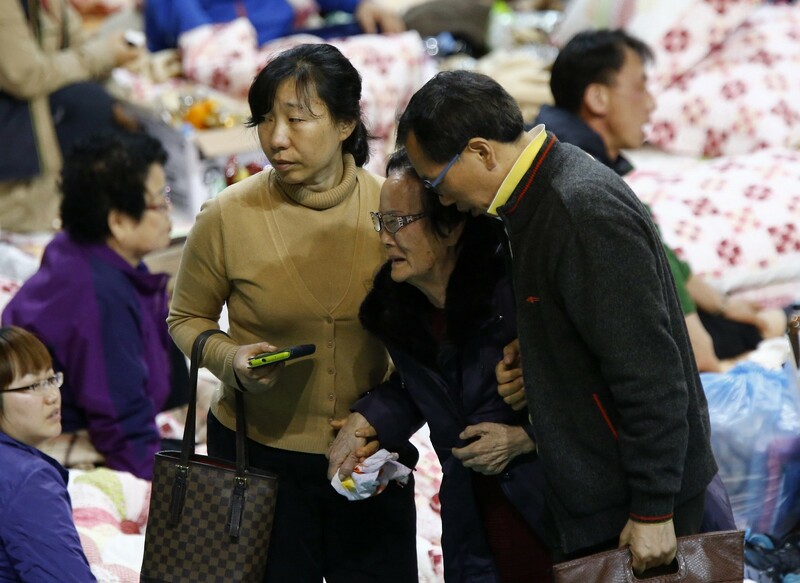 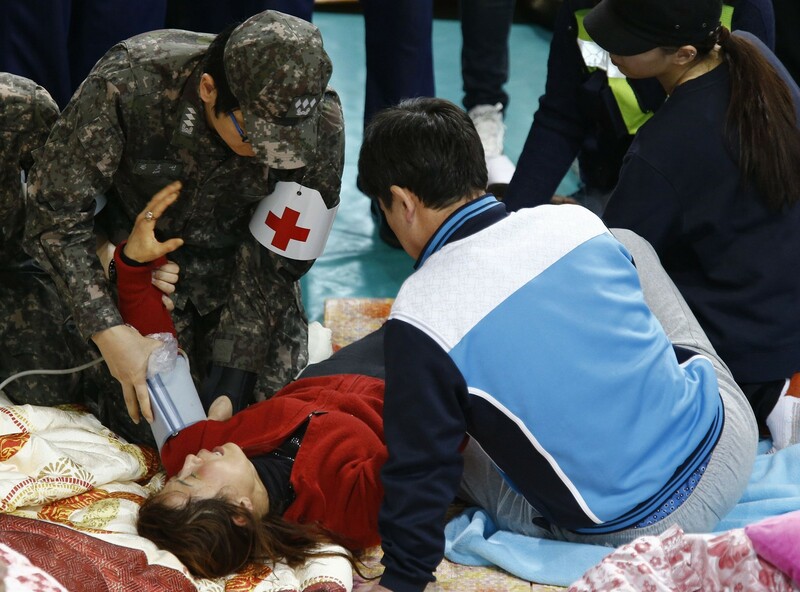 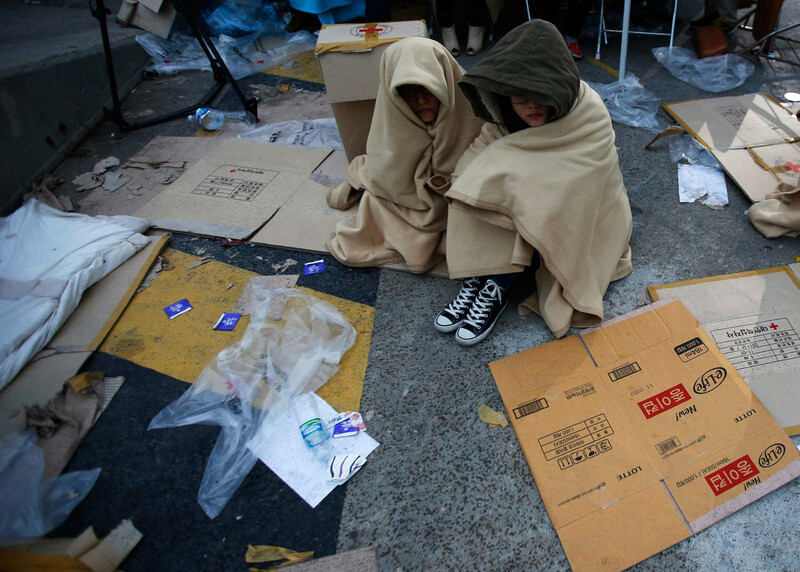 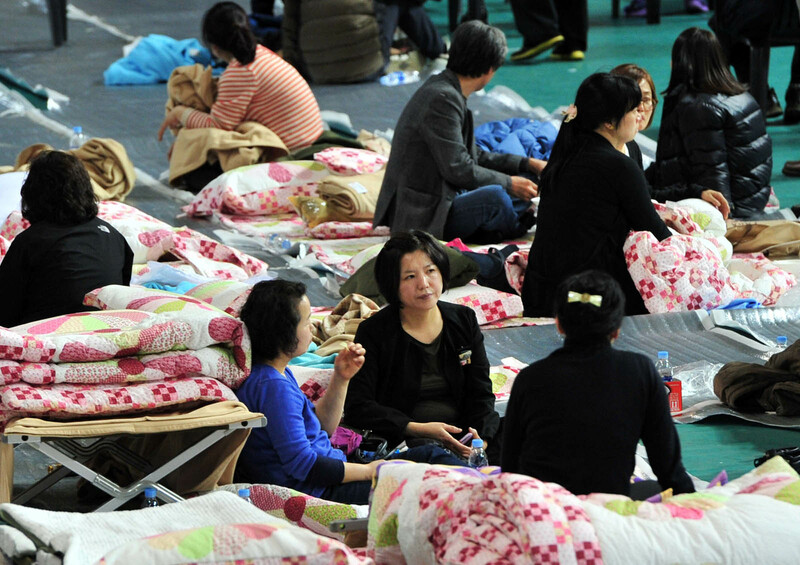 As of Thursday the confirmed death toll on Thursday stood at 171, with 131 still missing. 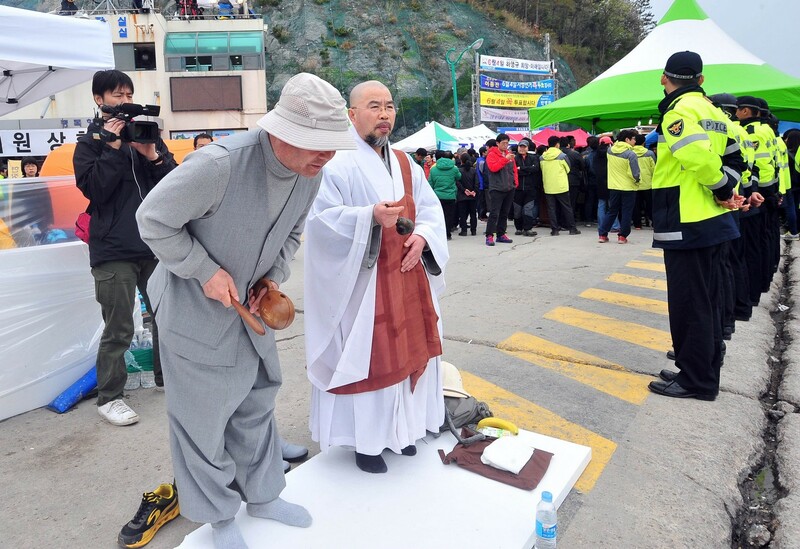 And a senior government official in Busan city lost his job after going ahead with a "reward trip" to Turkey, despite a general order for all civil servants to avoid any junkets at a time of national mourning.